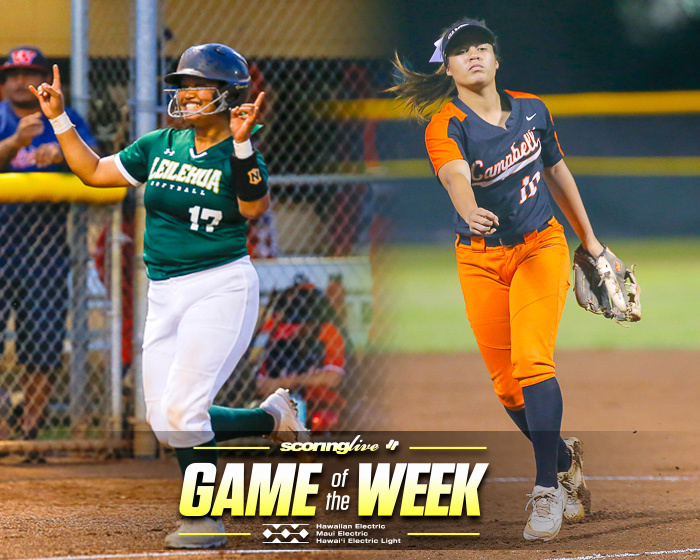 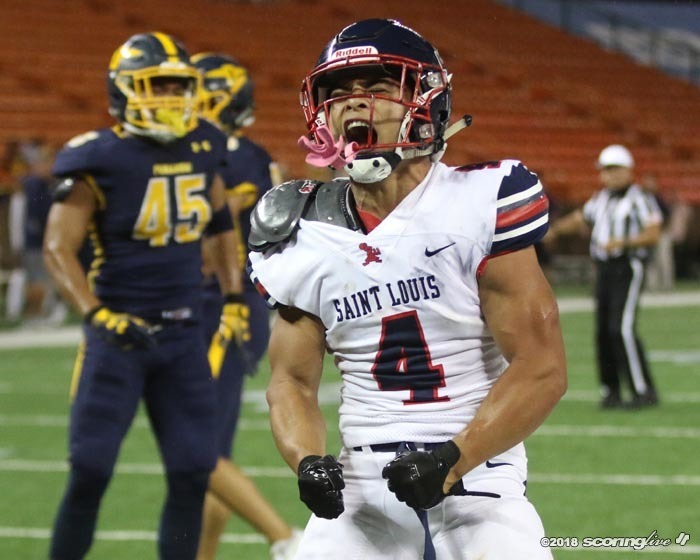 HALAWA — Top-ranked Saint Louis passed its toughest test to date in the form of No. 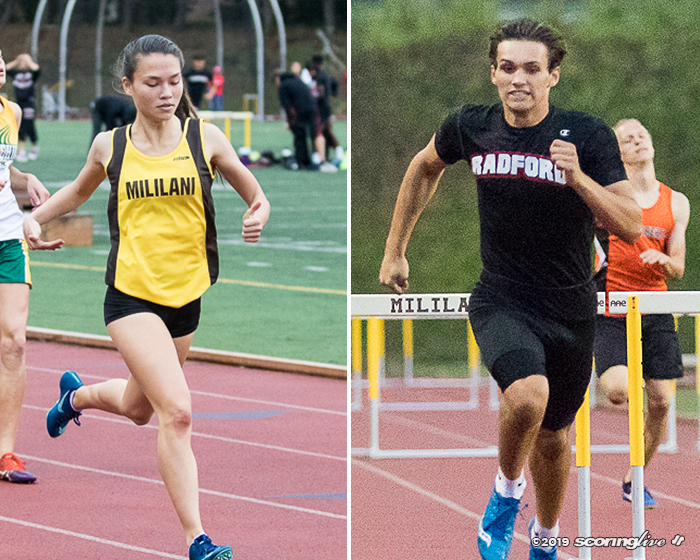 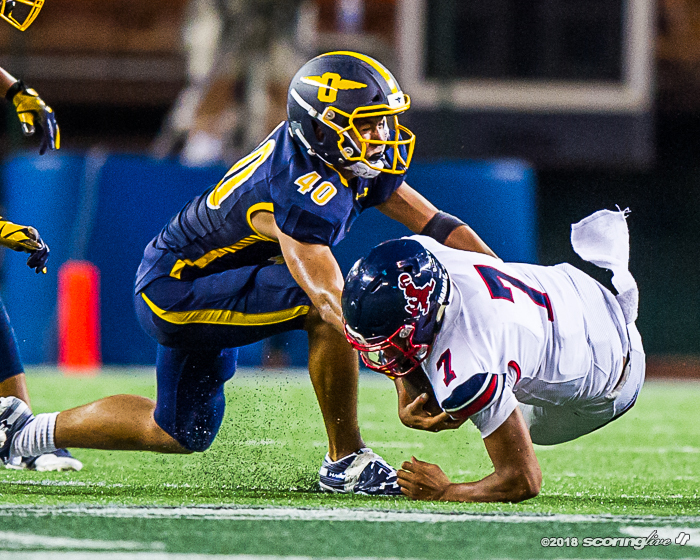 3 Punahou Saturday night. 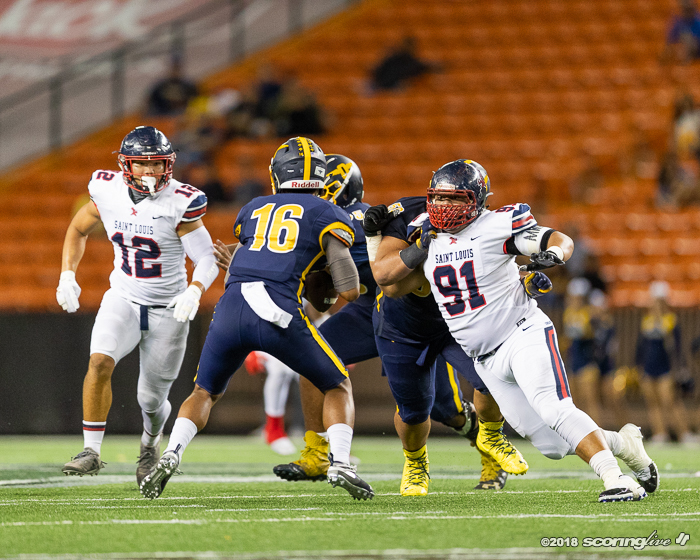 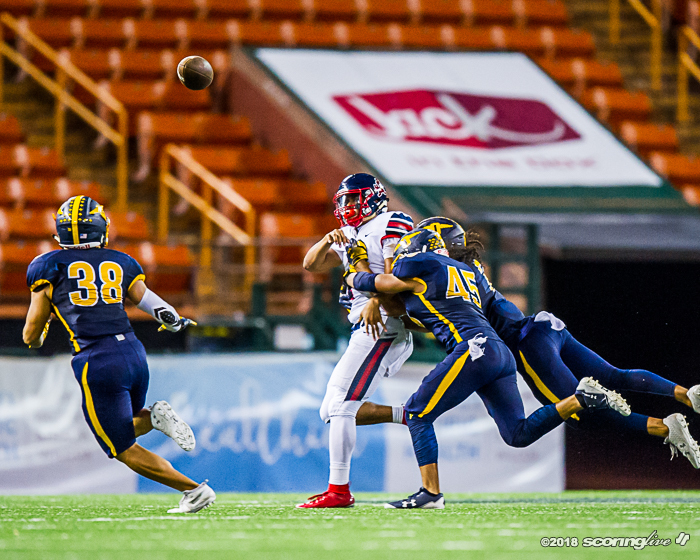 The Crusaders recorded six of their seven sacks after halftime en route to a 35-28 win over the Buffanblu before a crowd of about 7,000 fans in the nightcap of a Interscholastic League of Honolulu triple header at Aloha Stadium. 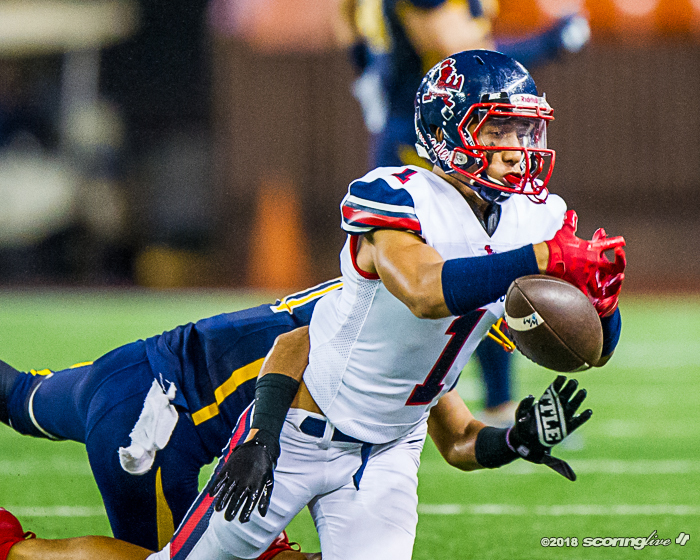 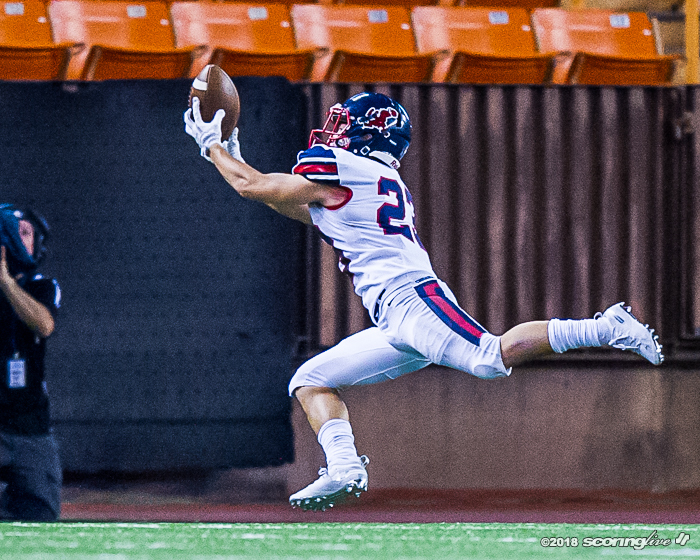 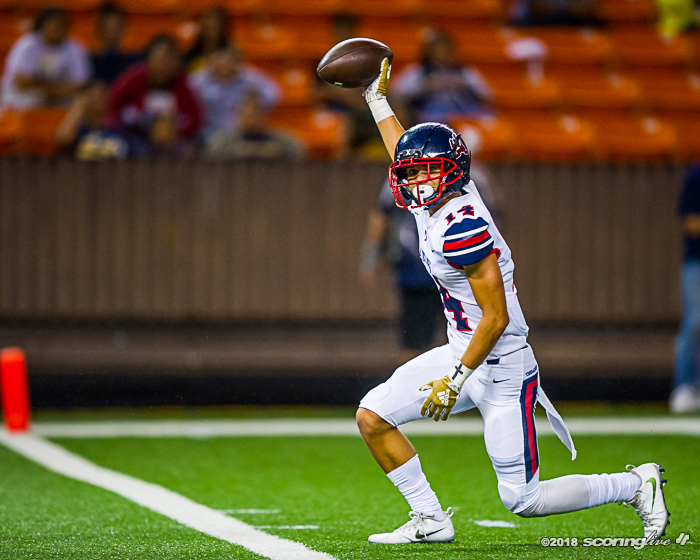 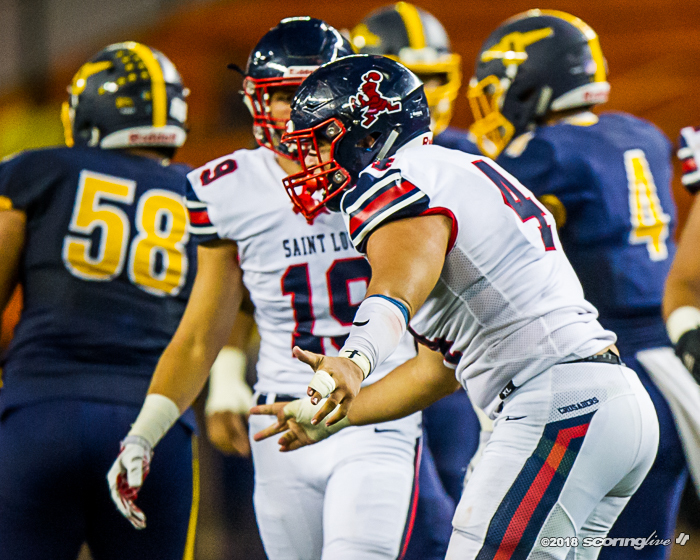 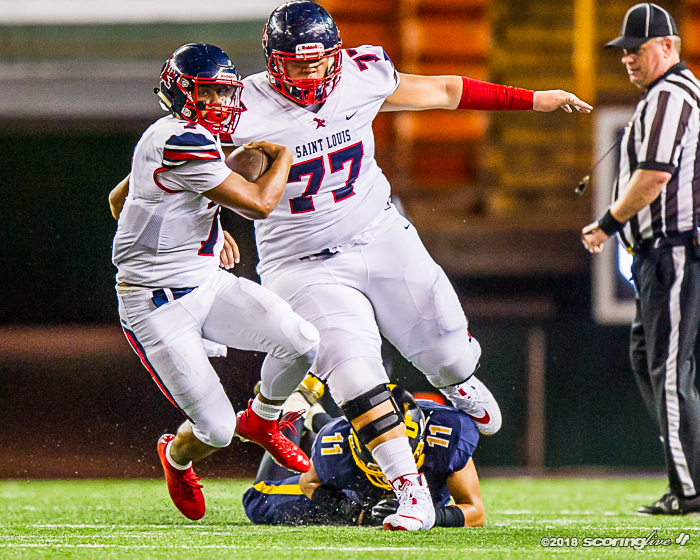 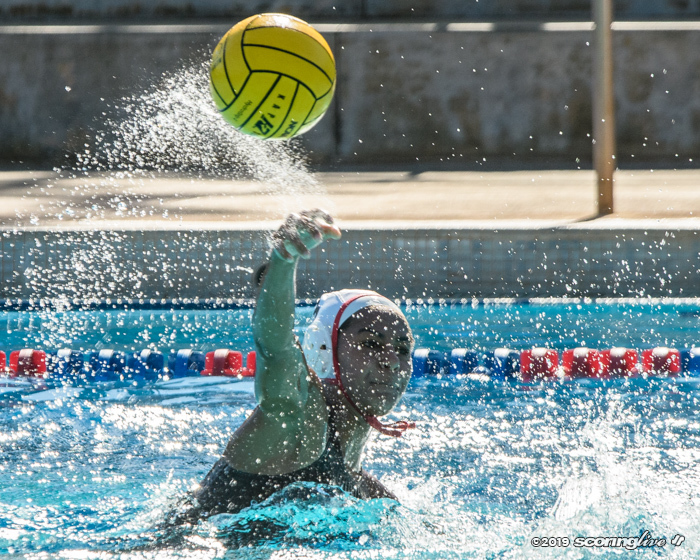 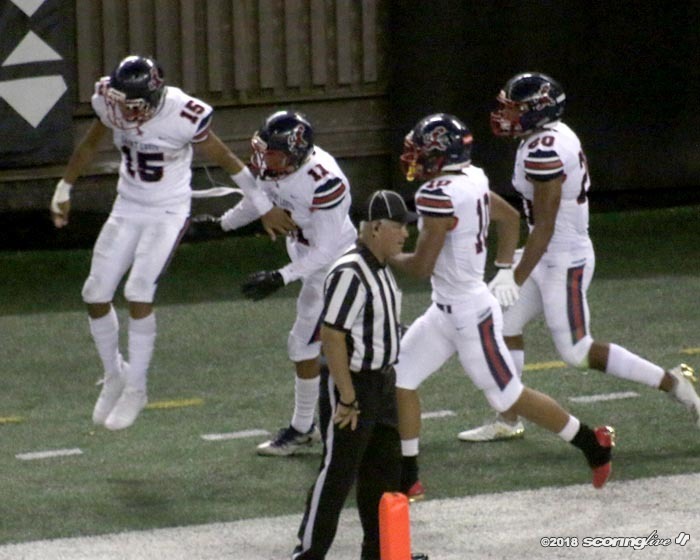 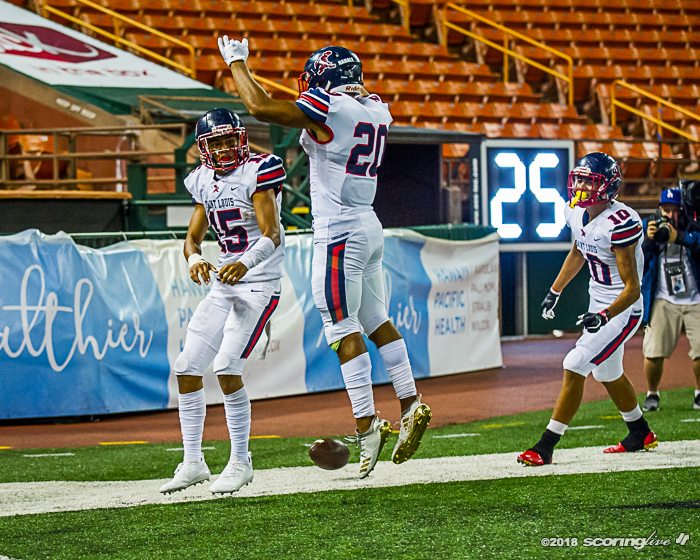 Saint Louis improved to 4-0 overall and 3-0 in league play to remain atop the ILH's Open Division standings. 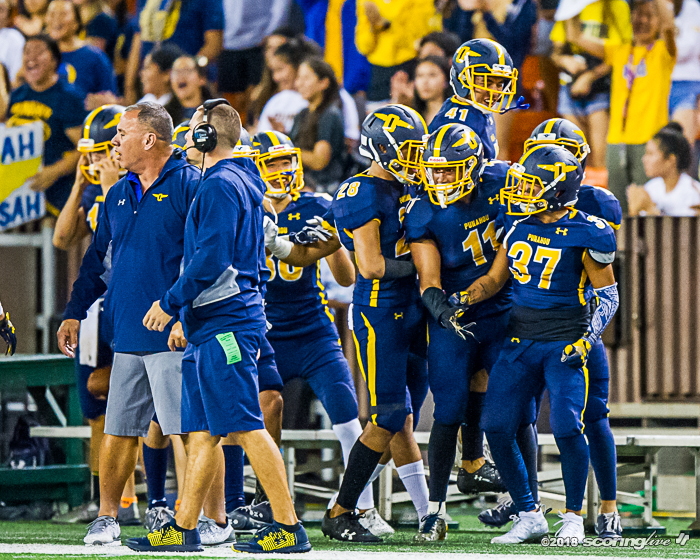 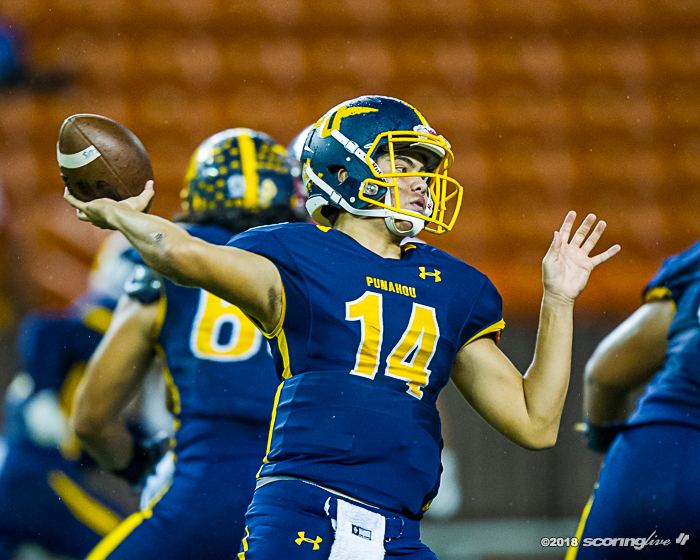 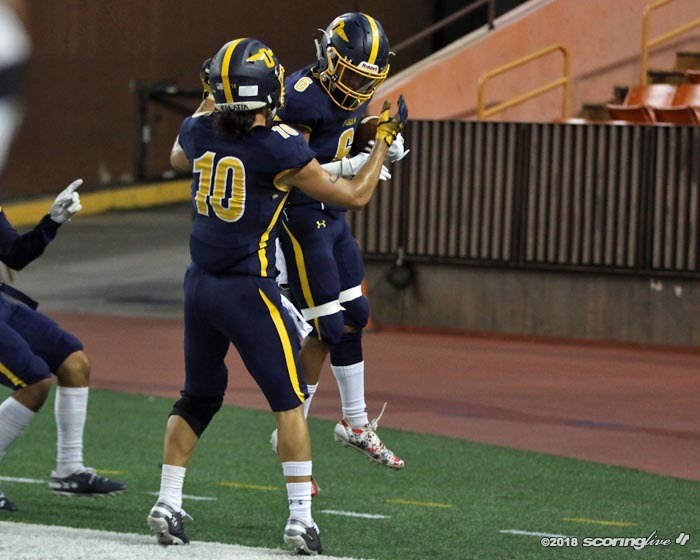 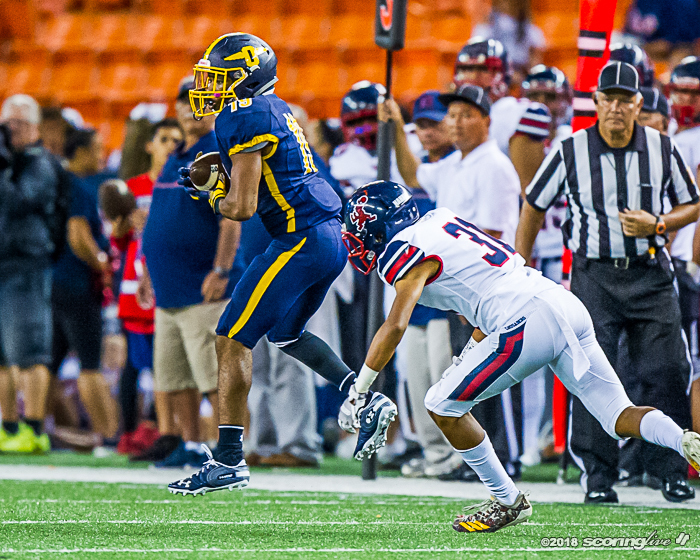 Punahou saw its three-game win streak snapped to fall to 3-2. 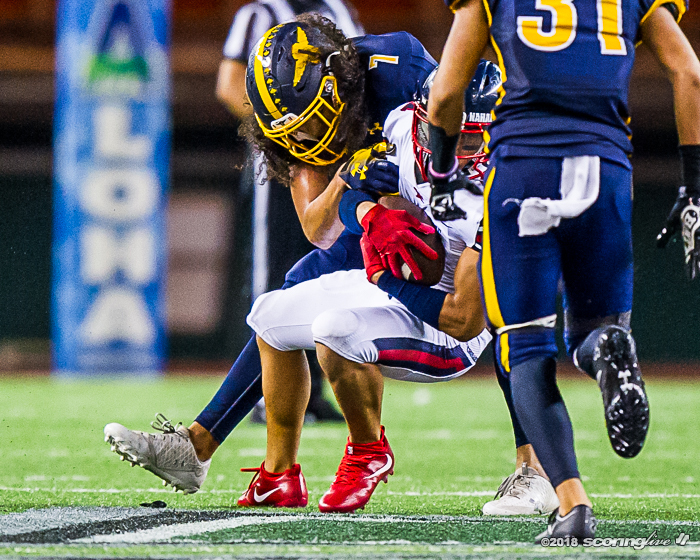 The Crusaders erased three different seven-point, first-half deficits to pull even with the Buffanblu at halftime, 21-all. 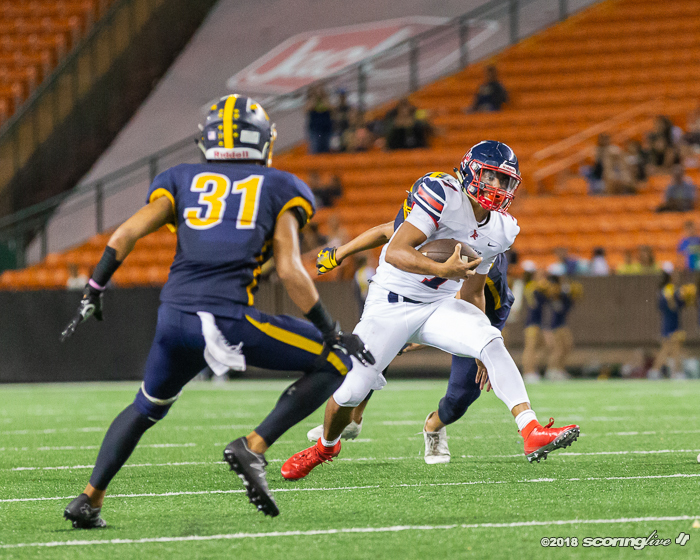 However, they clamped down defensively after the intermission and took the lead for good on Jayden de Laura's 1-yard quarterback sneak into the end zone with 8:05 left in the third quarter. 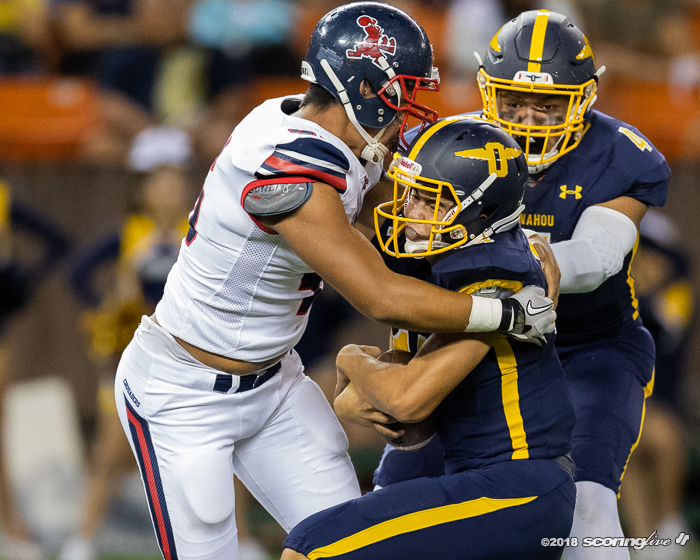 After throwing three first-half interceptions, de Laura settled in for the final two quarters, but it was the running game that got the Saint Louis offense going. 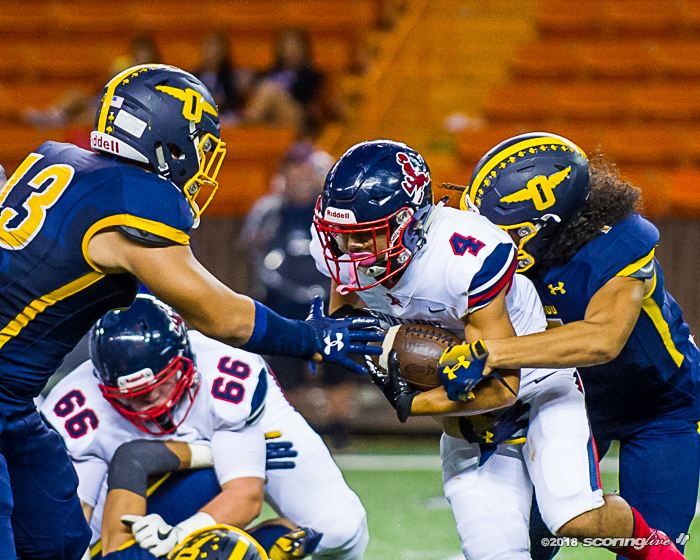 It ran the ball on seven of its 11 plays on the go-ahead possession. 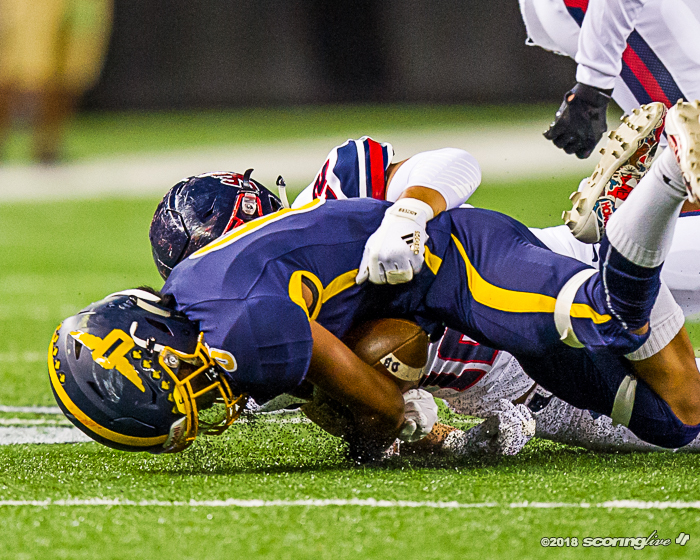 "I think you've got to. 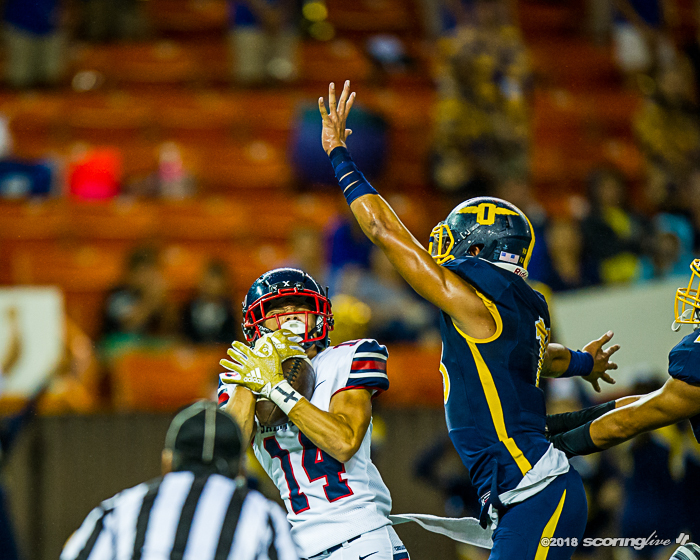 I mean, you just can't throw the ball and they were playing good pass defense — I was really impressed with their coverage — and to help that, running the ball is a big factor in our offensive scheme," Crusaders coach Cal Lee said. 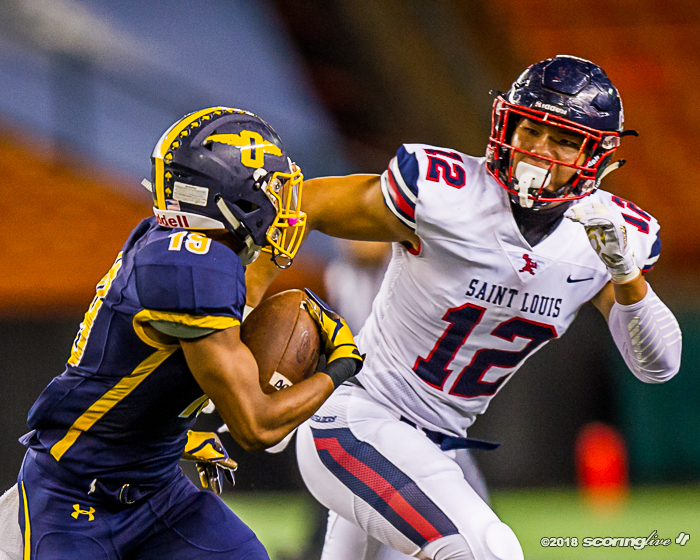 Following the de Laura TD run to give Saint Louis its first lead of the night, its defense took its turn imposing its will. 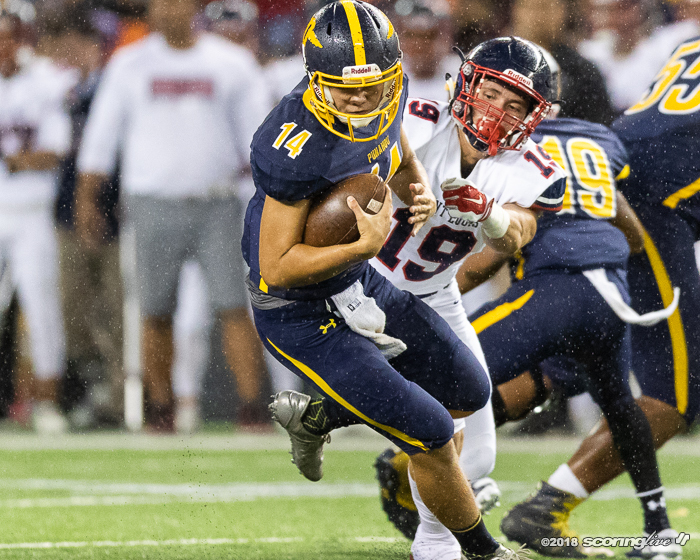 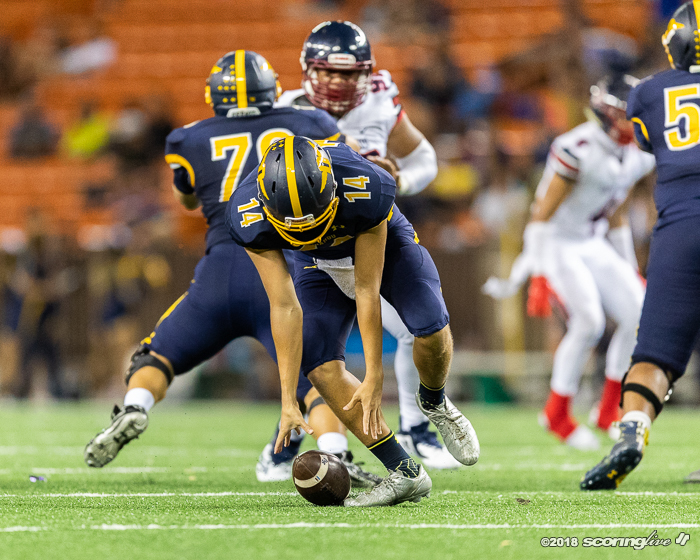 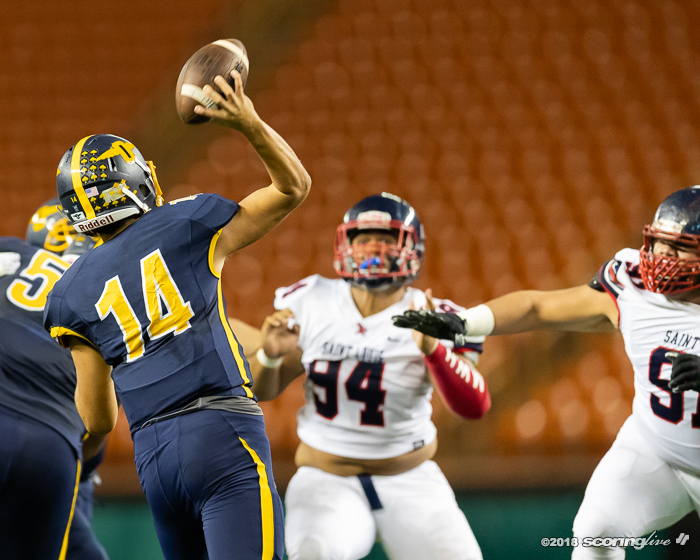 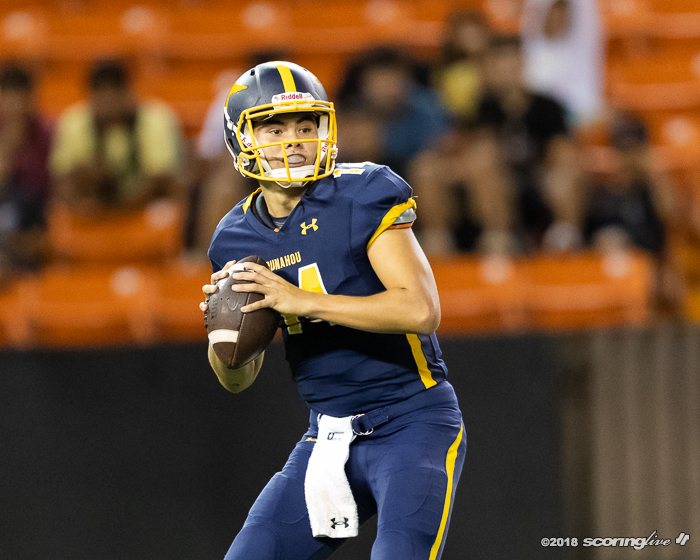 Punahou quarterback Hugh Brady was sacked three times on his team's first second-half possession, including on third-and-11 by Saint Louis' Faatui Tuitele and Jordan Botelho. 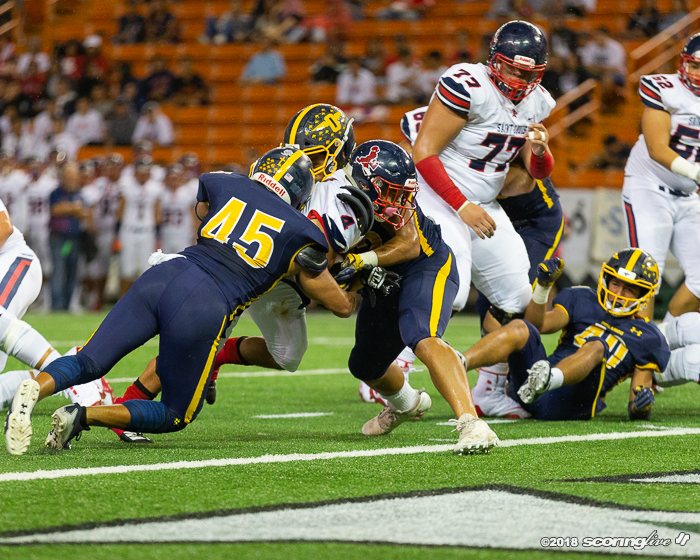 "We just kind of emphasized getting up the field and instead of locking up with their O-linemen, just getting through the gaps and avoid touching them. 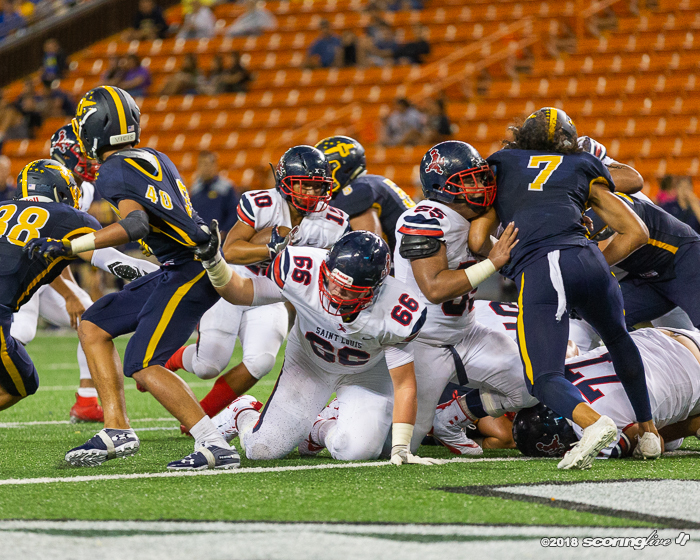 We just had to push the pocket more and I think we did a good job at doing that," said Tuitele, a 6-foot-2, 299-pound defensive lineman. 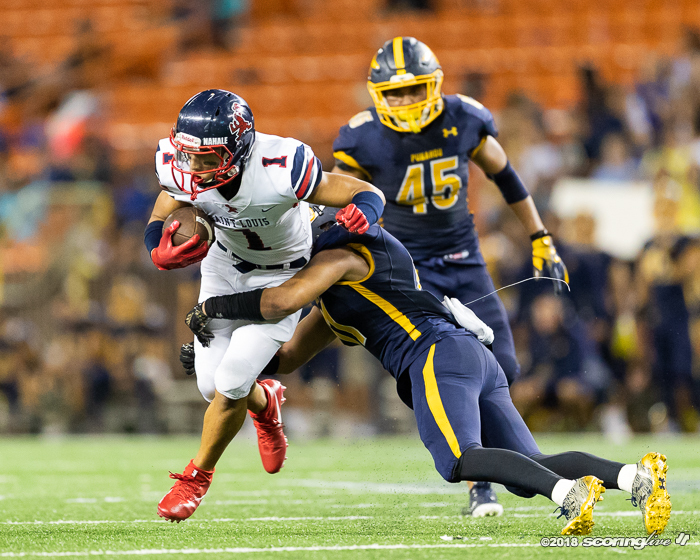 Saint Louis turned it over on downs on its ensuing drive, but Brady was picked off by Kamoi Latu three plays into Punahou's next possession. 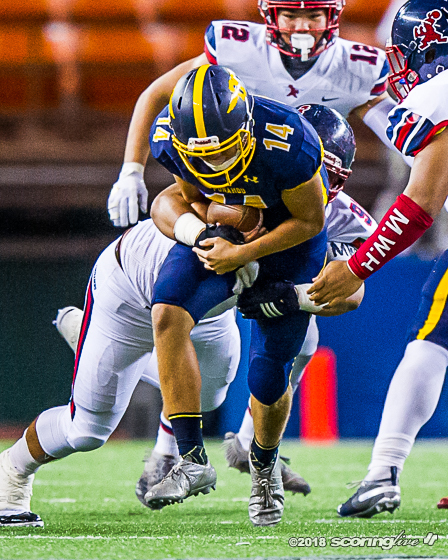 Latu worked his way down the left sideline after the change of possession all the way to the end zone for a 43-yard pick-6. 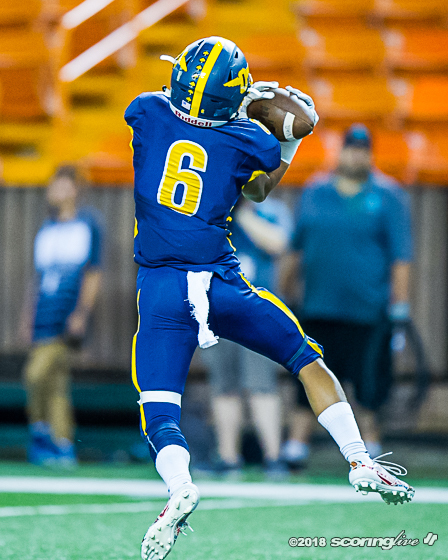 "Maybe we played better," Lee said of the second half. 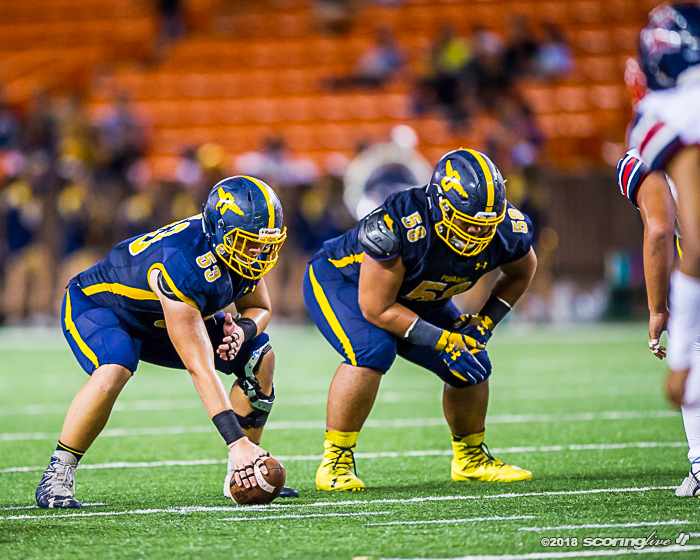 "We made little adjustments, (but) they just gotta step up and play. 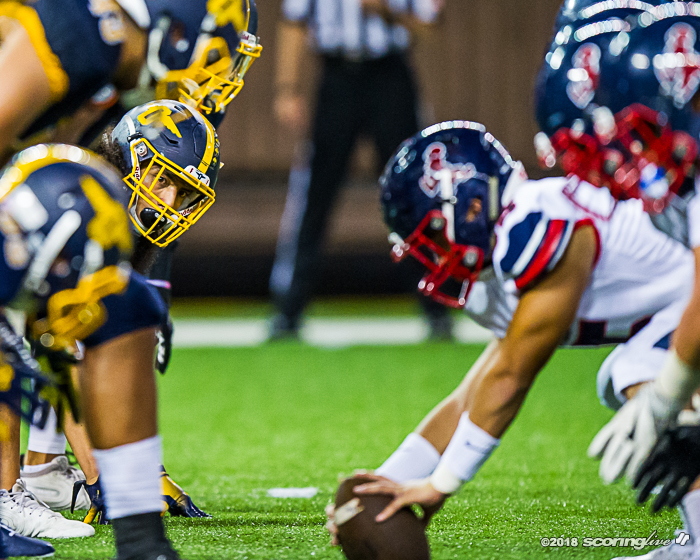 They know what's at stake, playing a good team you gotta come out here fired up. 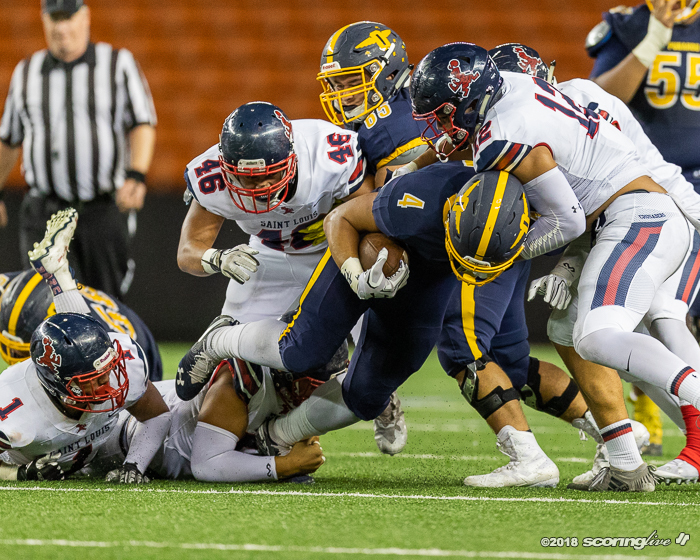 You've only got two quarters to do your thing, so I told them, ‘let's leave everything on the table,' and thank goodness they played better than the first half." 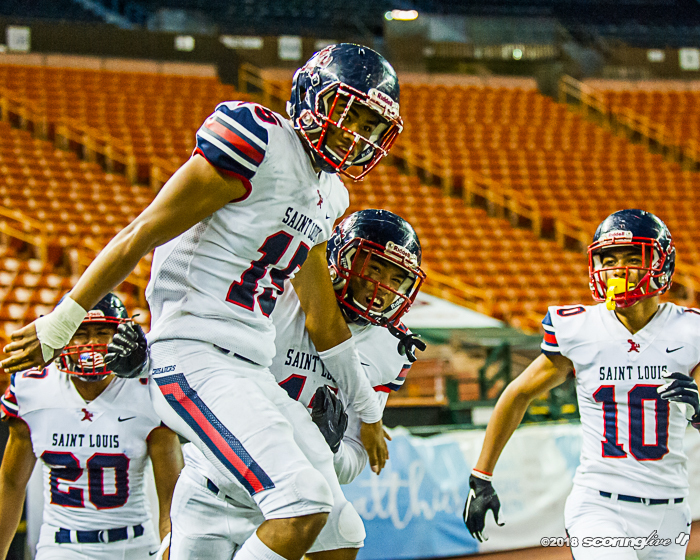 After the Garyn Napuunoa extra point, Saint Louis took its largest lead at 35-21 with 11:47 left in the game. 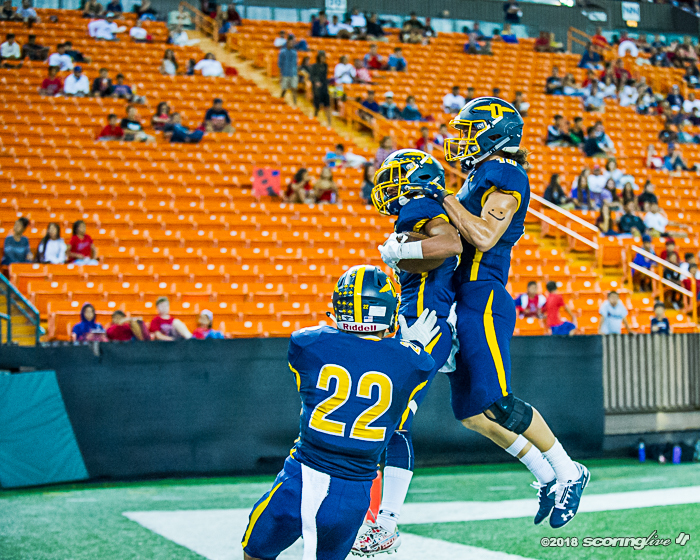 Punahou pulled within a score with 5:30 remaining. 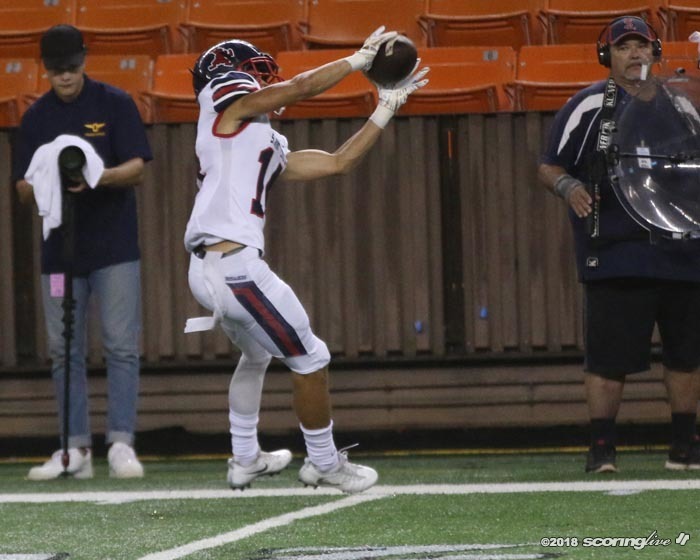 Brady tossed a 20-yard TD pass over the middle to Moku Dancil-Evans to cap a 10-play, 71-yard drive. 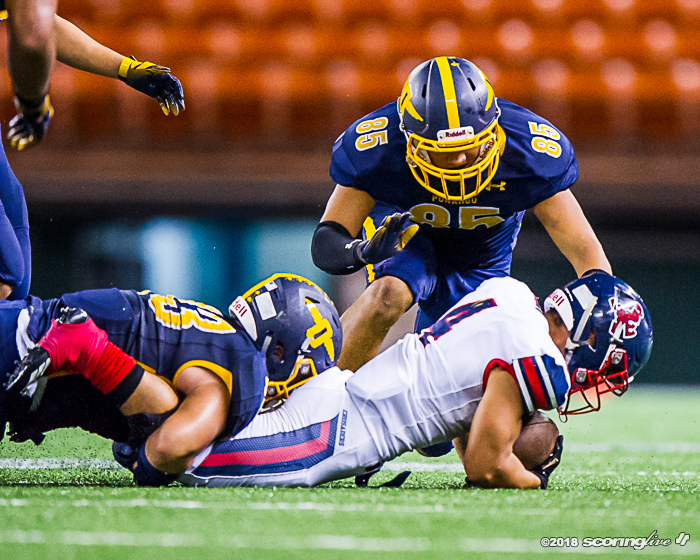 Tim Horn tacked on the PAT to make it 35-28. 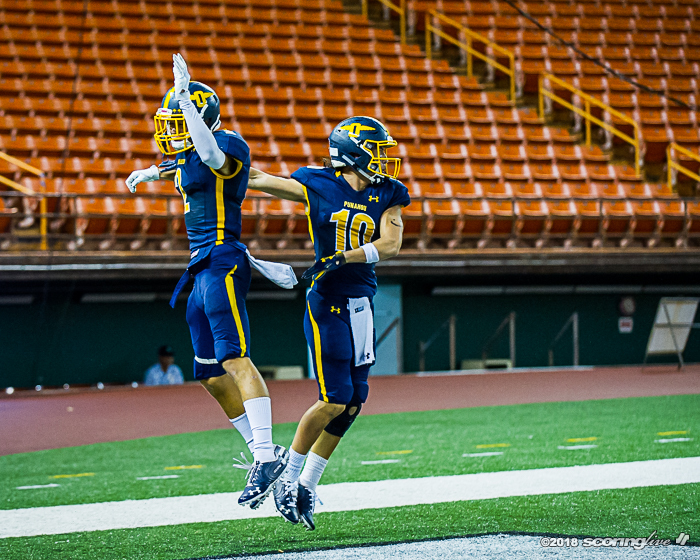 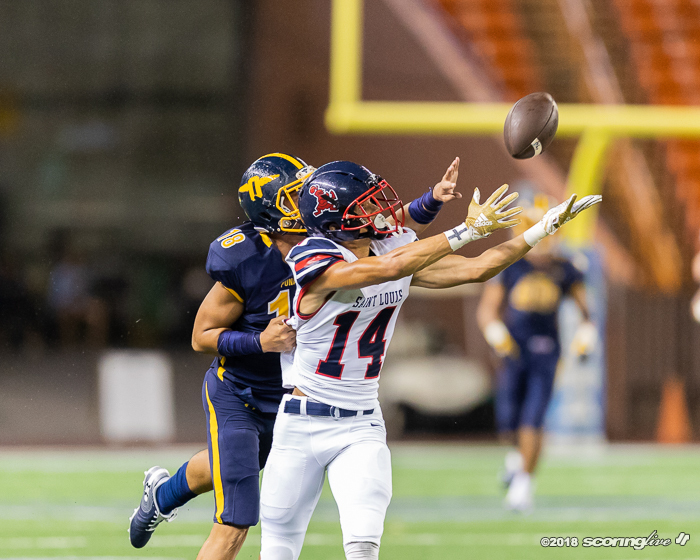 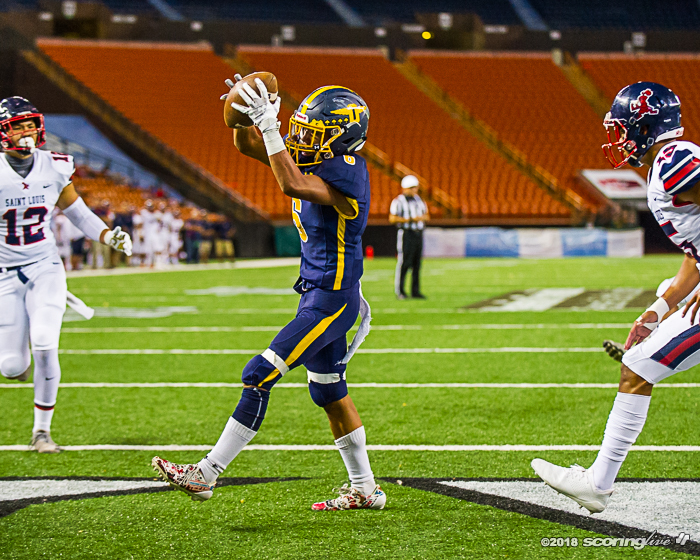 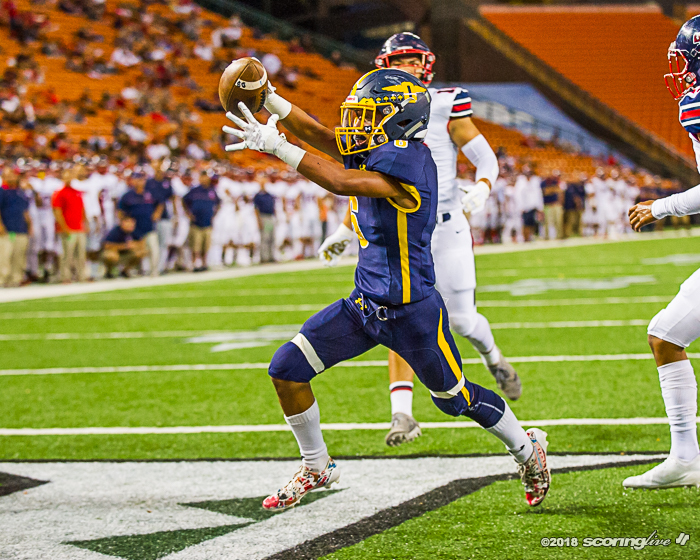 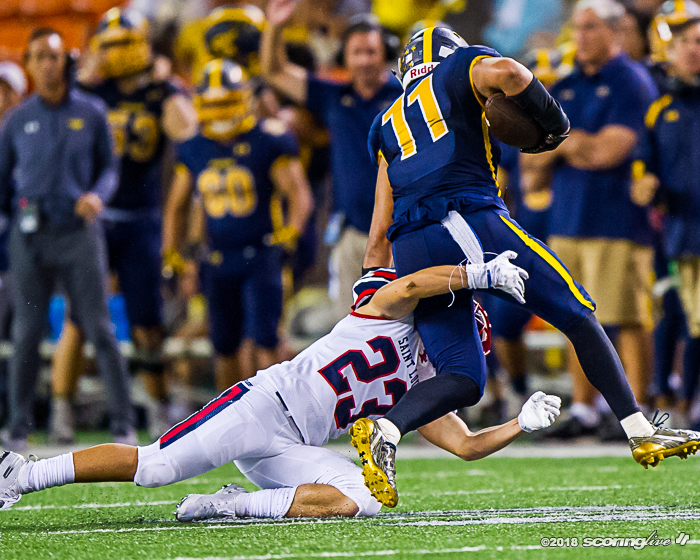 Following a Saint Louis three-and-out, Punahou got the ball back at the Crusaders' 49-yard line with 3:15 to play. 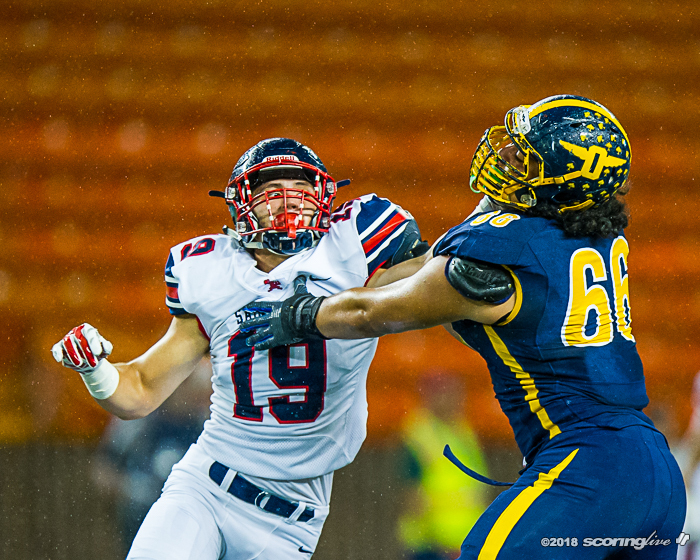 However, Brady's pass on first down, intended for Tamatoa Falatea, fell incomplete. 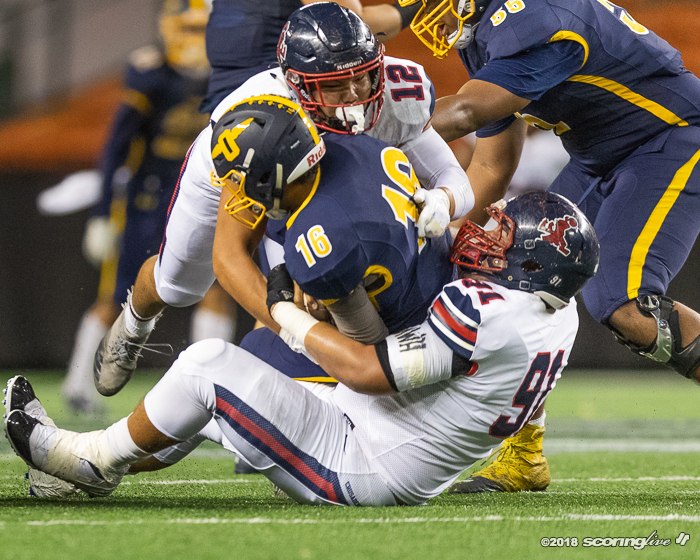 He was then sacked for a nine-yard loss by Gino Quinones on the next play, before Tuitele dropped him for a two-yard sack on third down. 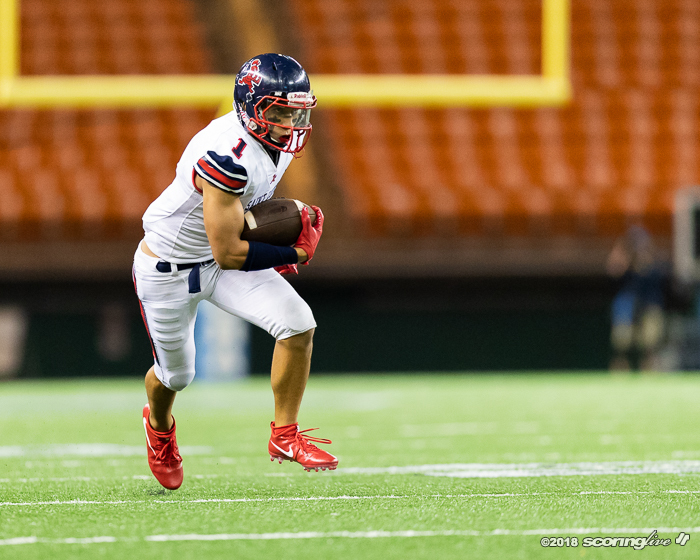 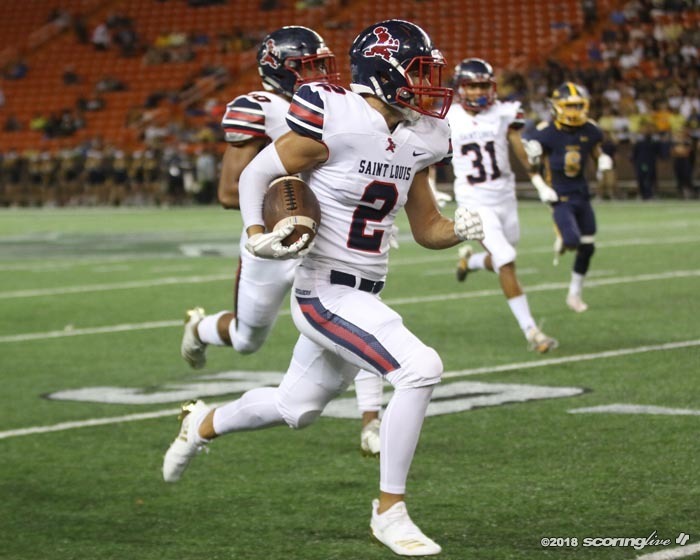 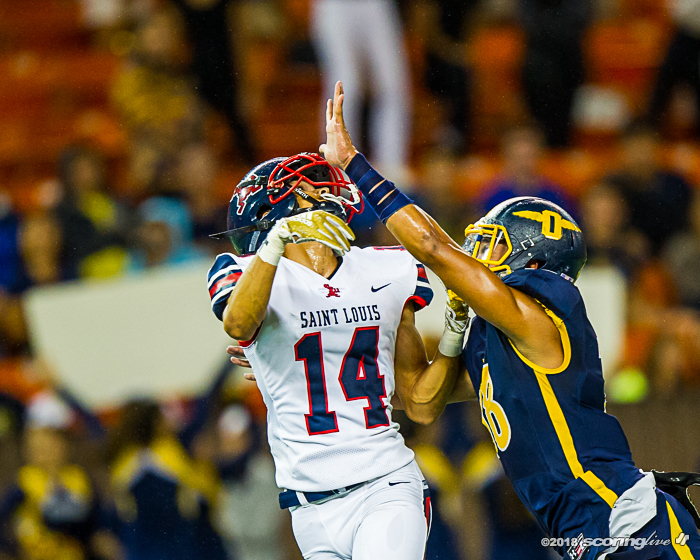 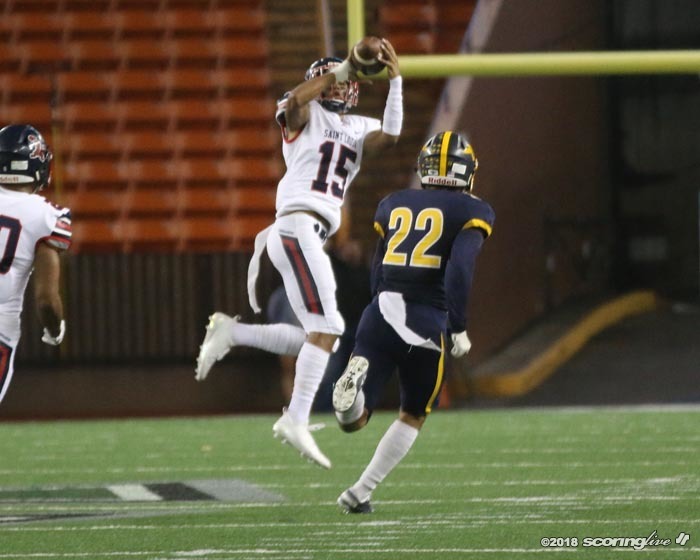 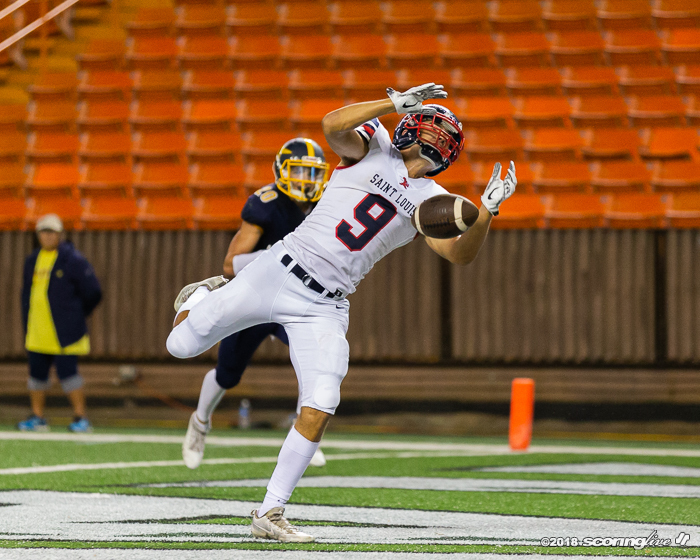 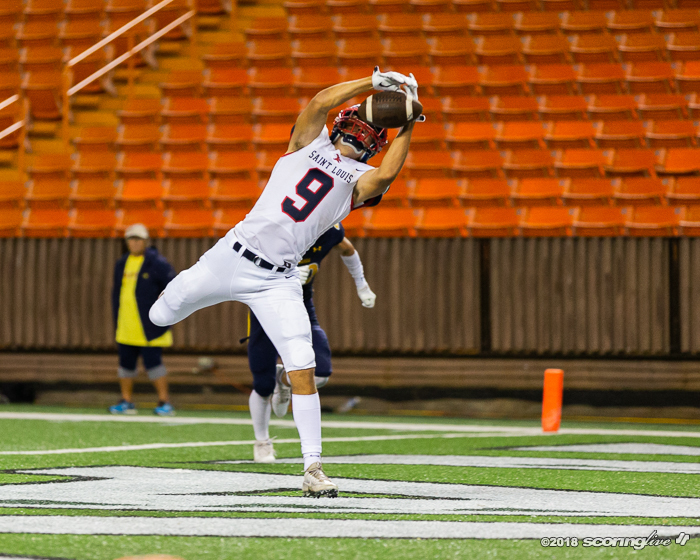 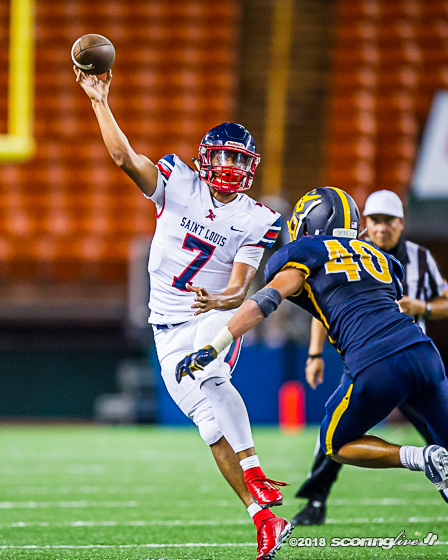 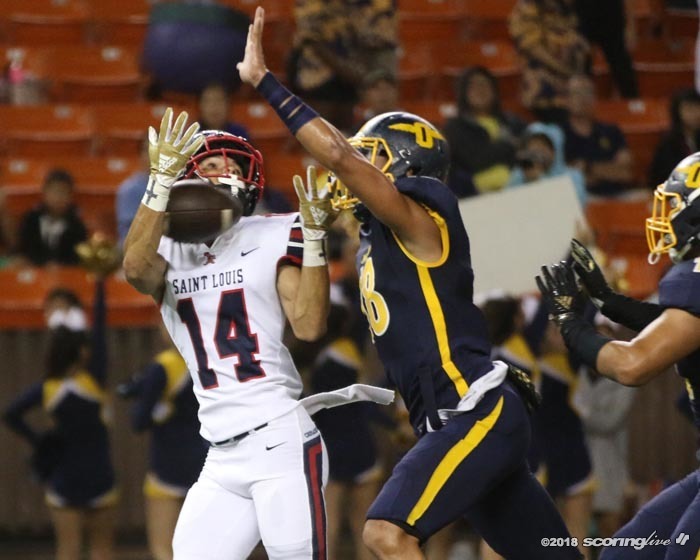 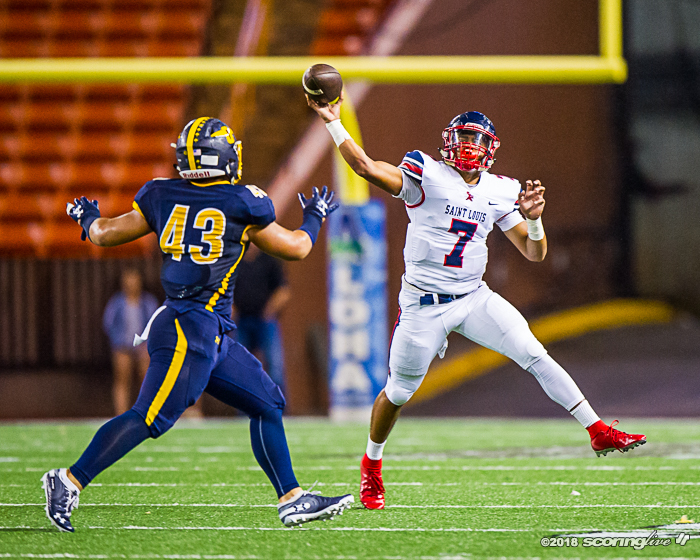 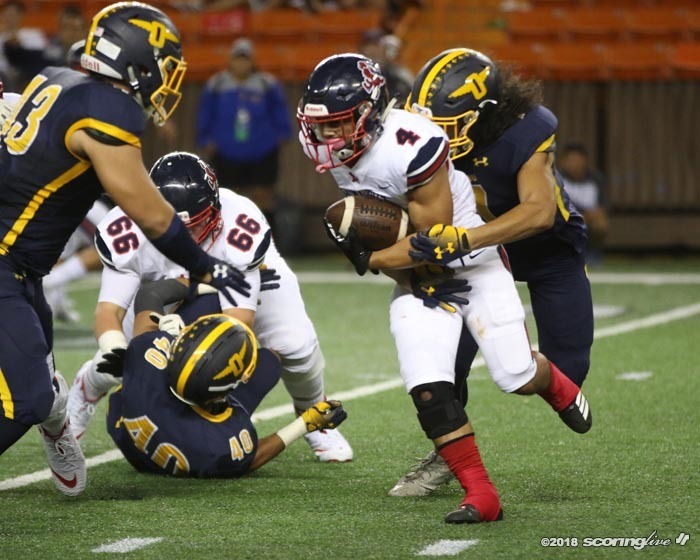 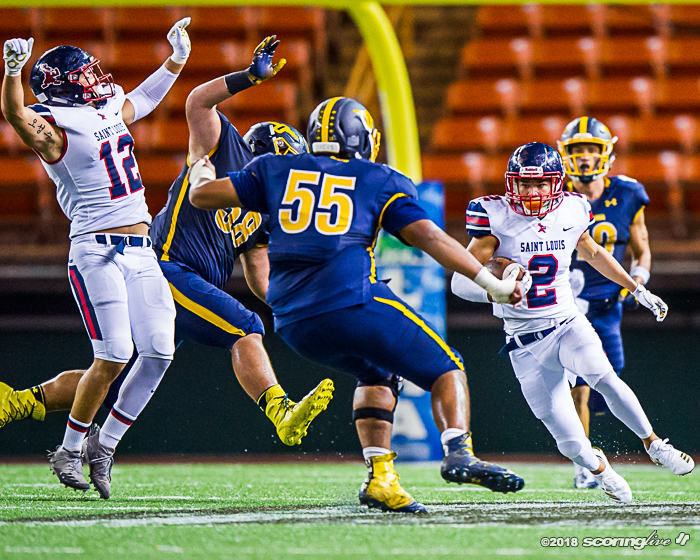 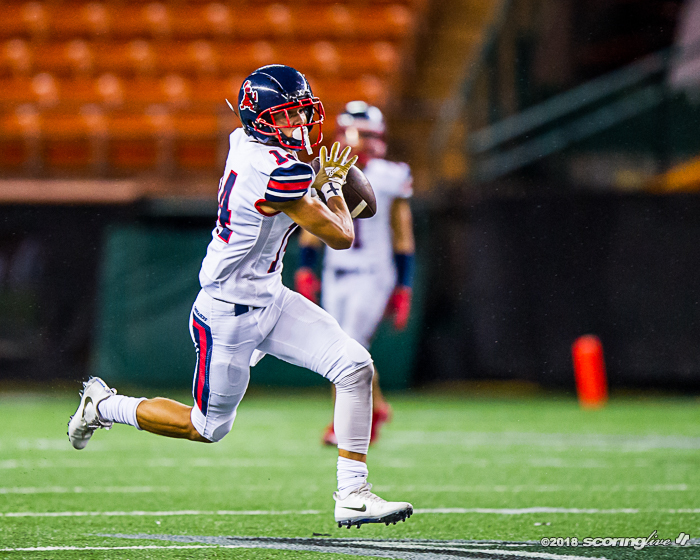 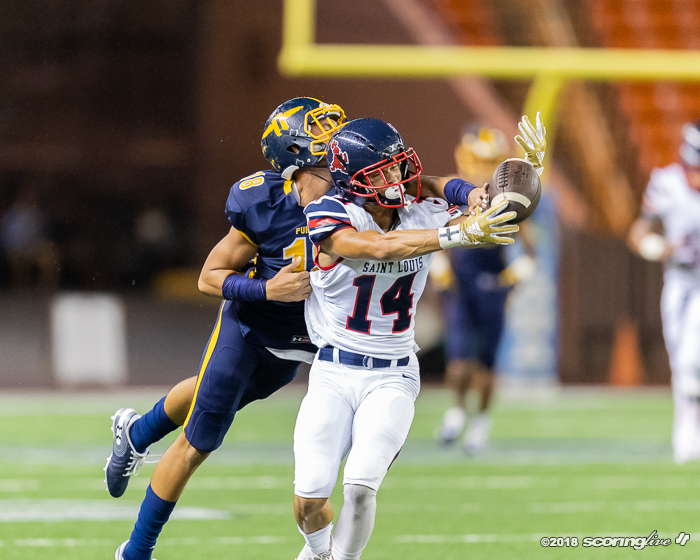 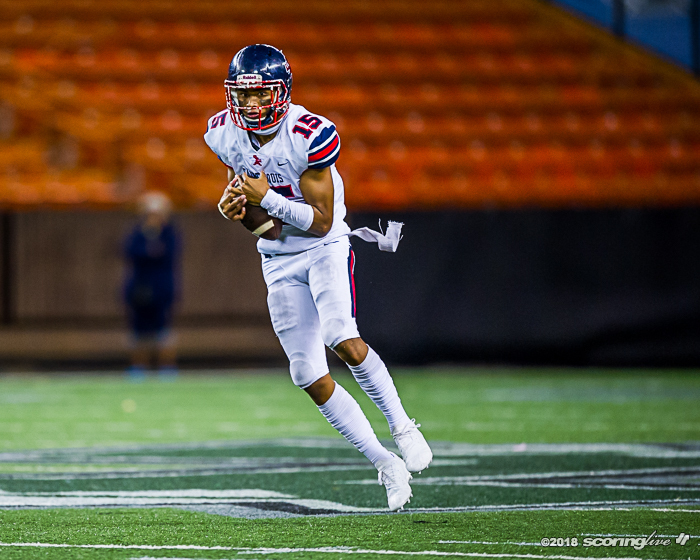 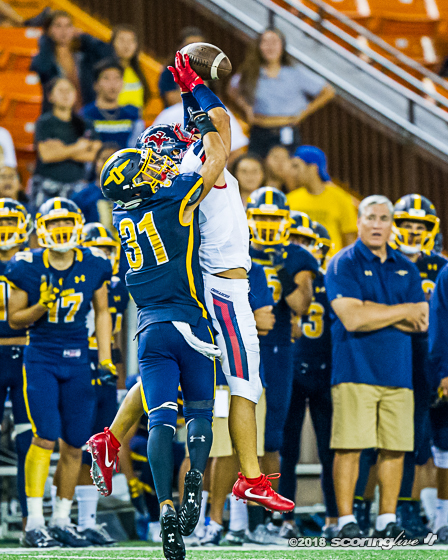 Brady completed a pass to Dancil-Evans on fourth-and-21, but it was three yards short of the line to gain and Punahou turned it over on downs to allow Saint Louis to run out the clock. 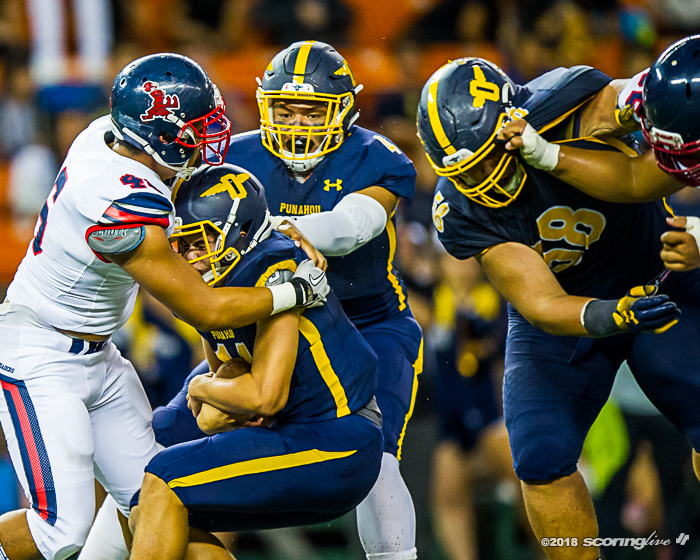 Despite limited playing time due to an undisclosed injury, Tuitele finished with three sacks. 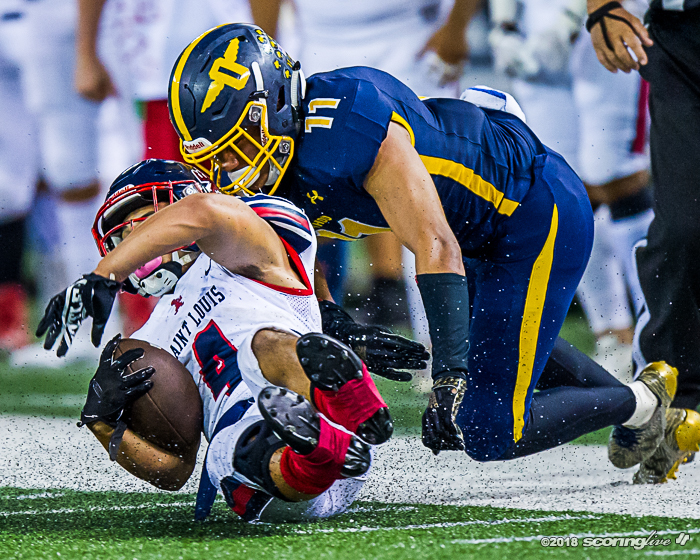 Quinones added two sacks and Botelho and Fiaseu had one apiece. 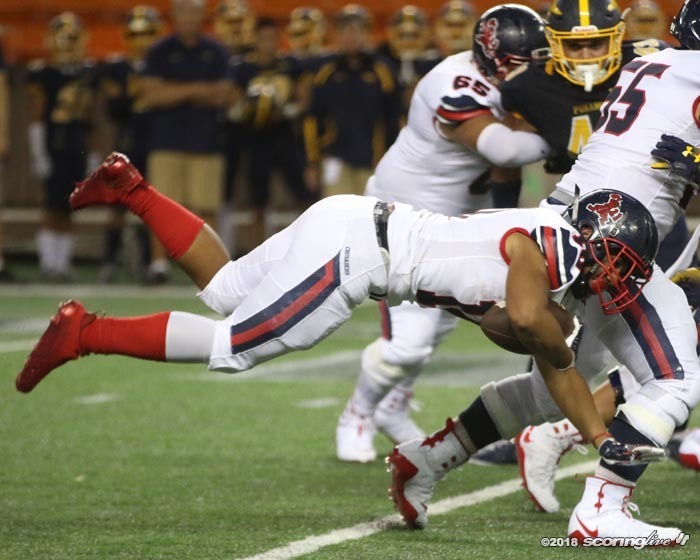 "I was happy for my brothers who got there before me," Tuitele said. 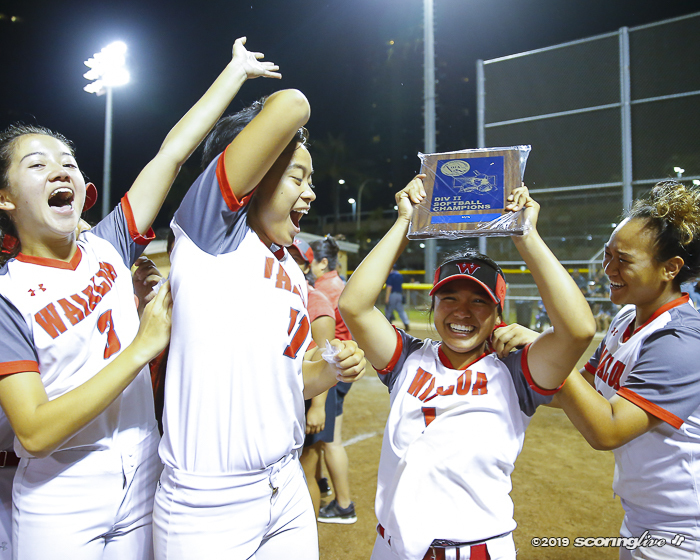 "I love seeing them play and do their thing, because sometimes they don't get to play as much, so it was good to see them do their thing tonight. 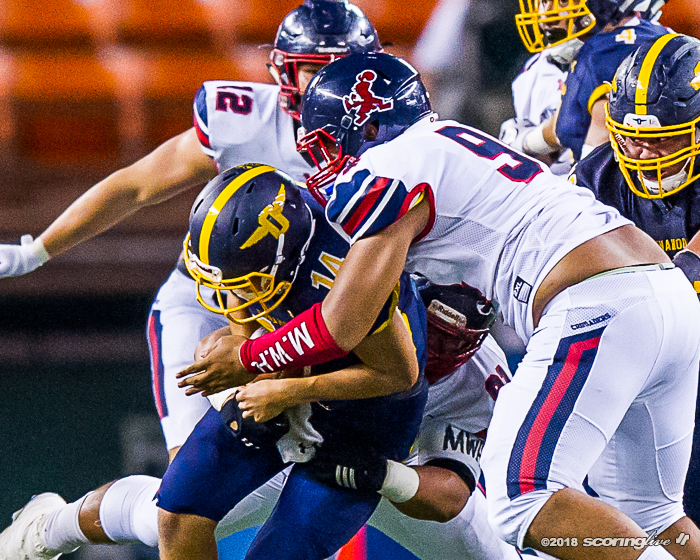 I know a lot of them got sacks, too, so I'm so happy for all of them." 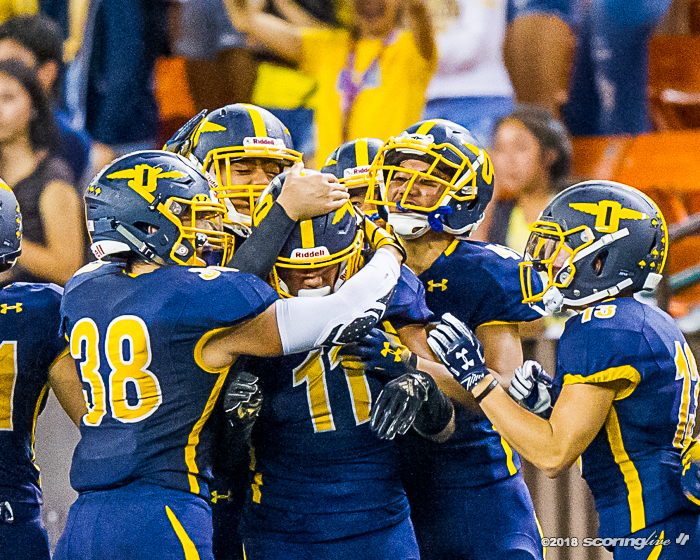 Lee said he challenged his defensive front seven at halftime to get after the quarterback. 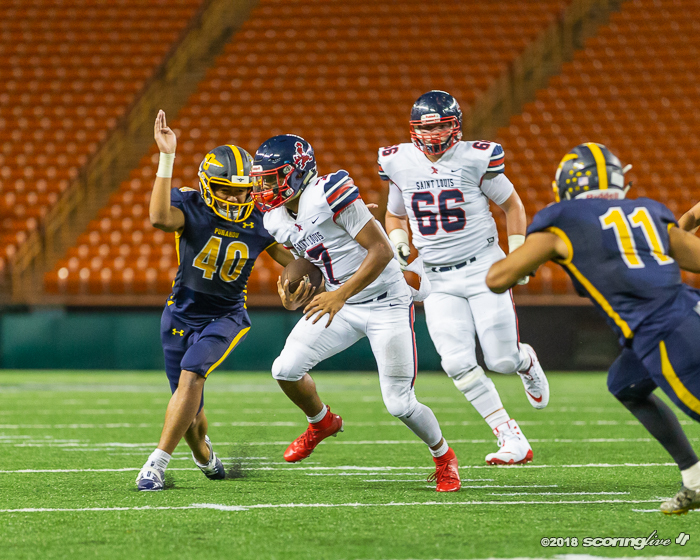 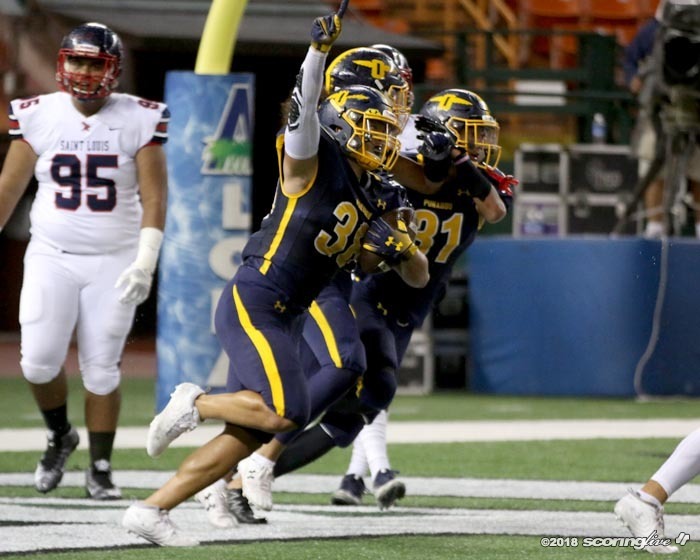 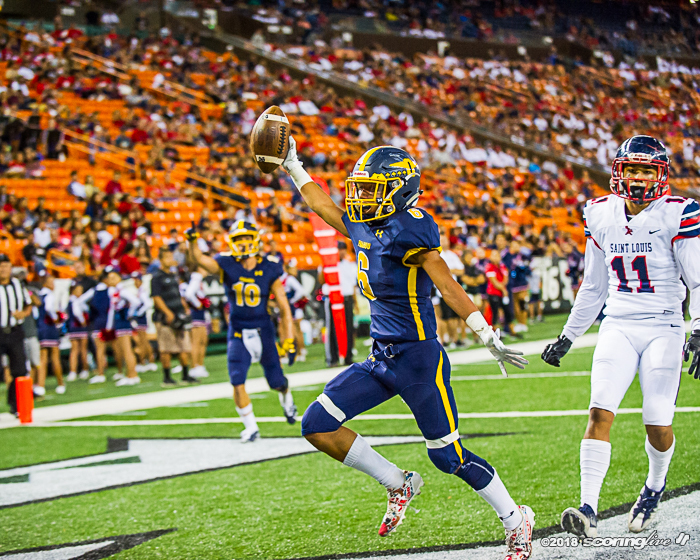 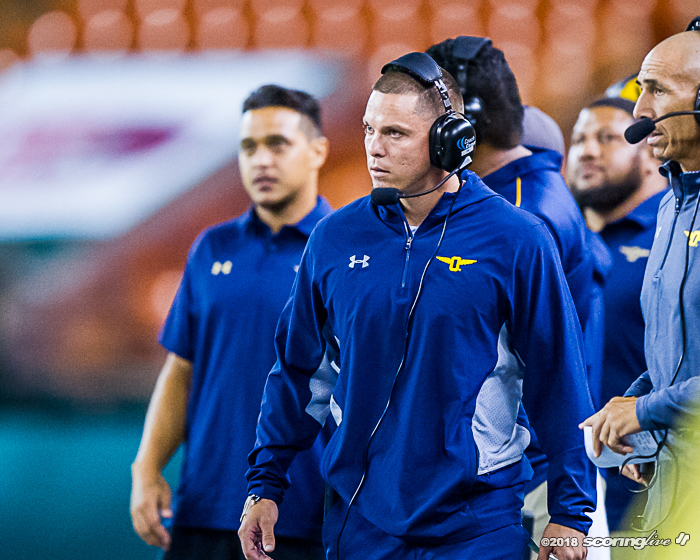 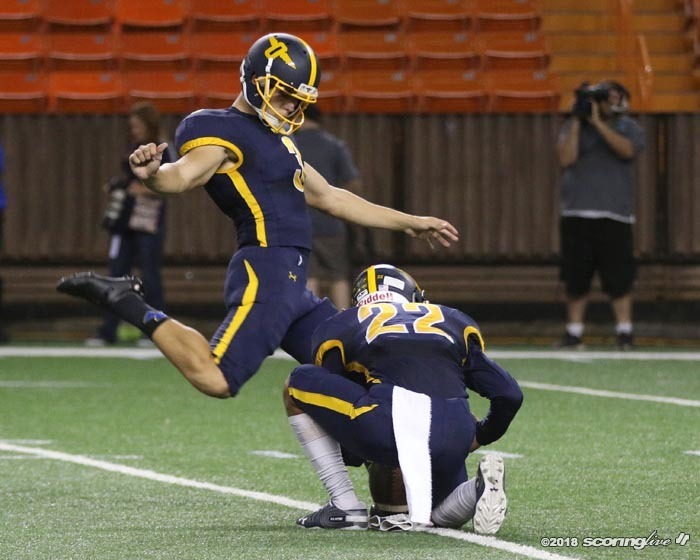 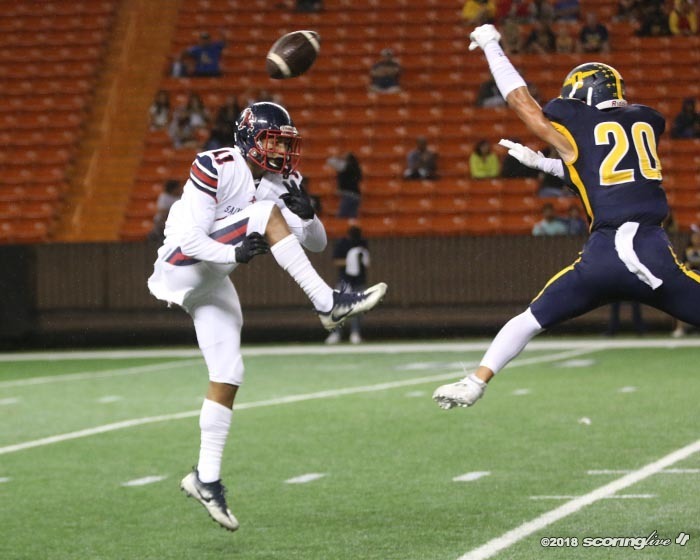 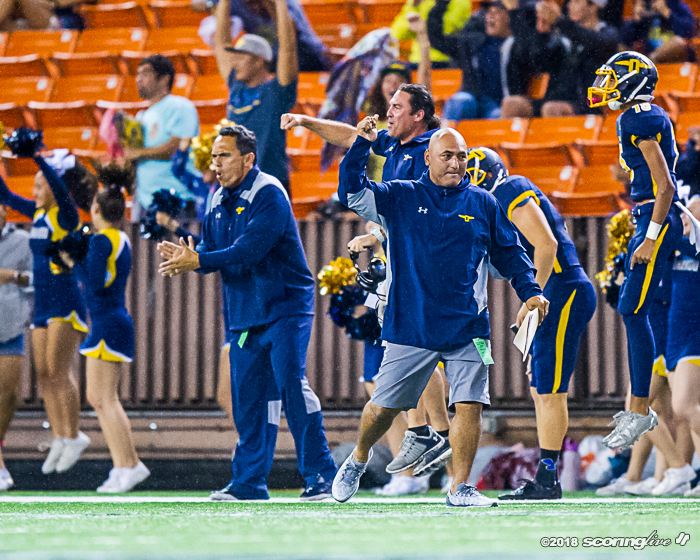 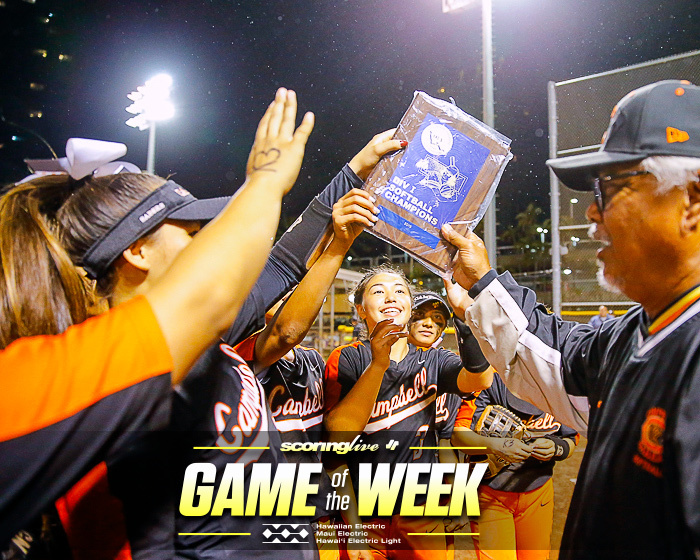 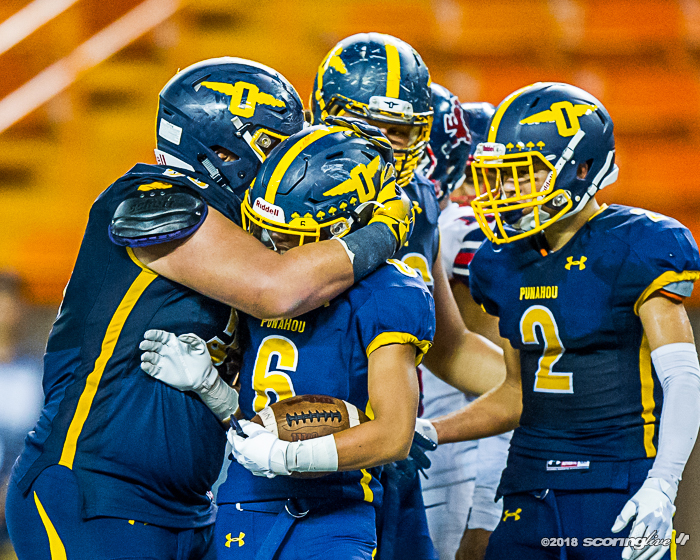 "Absolutely, because Punahou was throwing the ball and they were very successful throwing the ball. 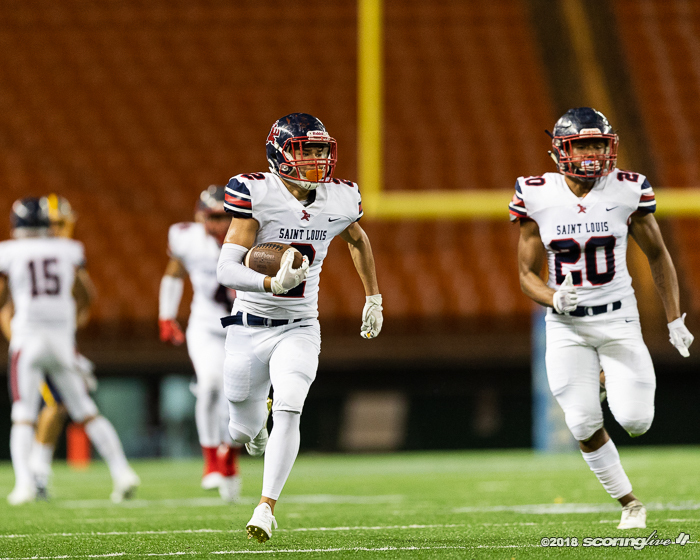 To their credit, they saw our weaknesses and they exploited it so we had to come out and do some different things to change it up, so I'm glad things worked out for us," said Lee, the winningest prep coach in state history. 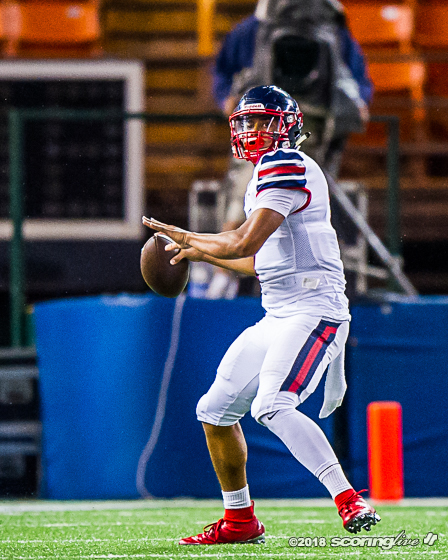 Brady finished with 308 passing yards on 21-of-37 passing, but was intercepted four times. 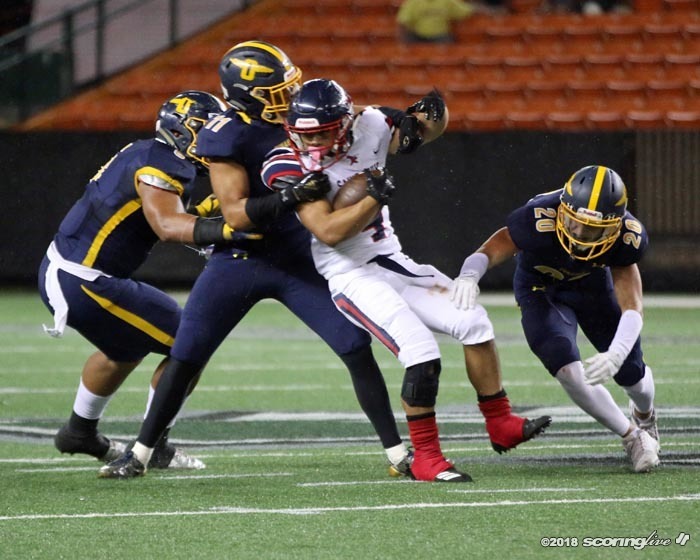 The Buffanblu were held to minus-15 rushing yards on 21 attempts. 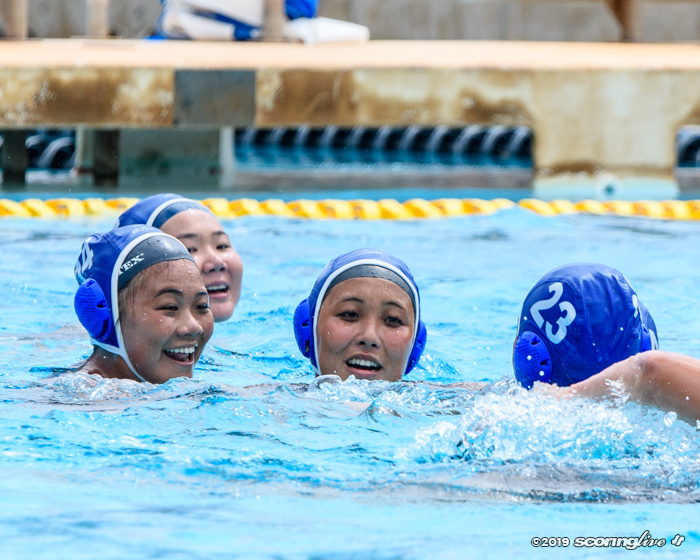 "I think they played well. 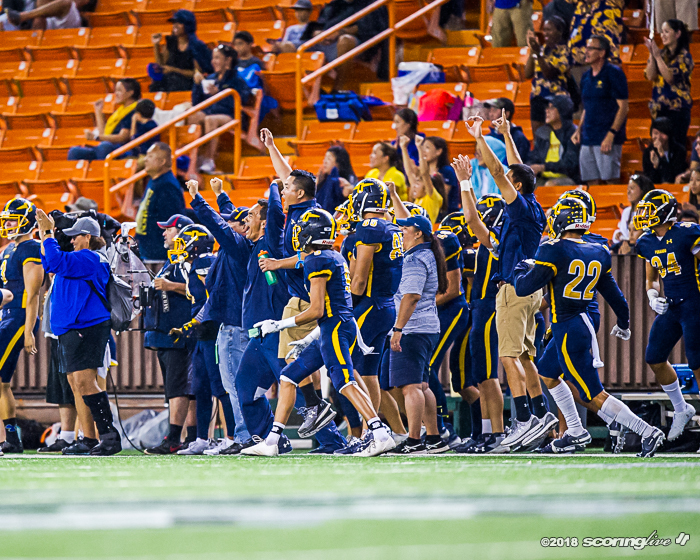 You never want to take anything away from them. 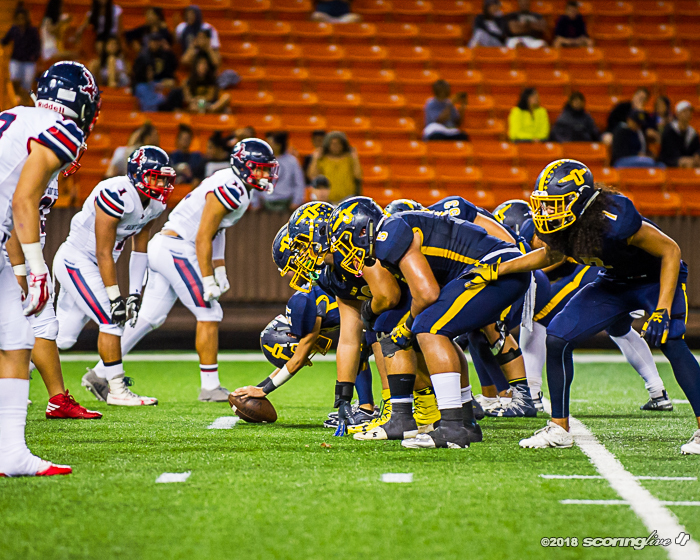 They played well. 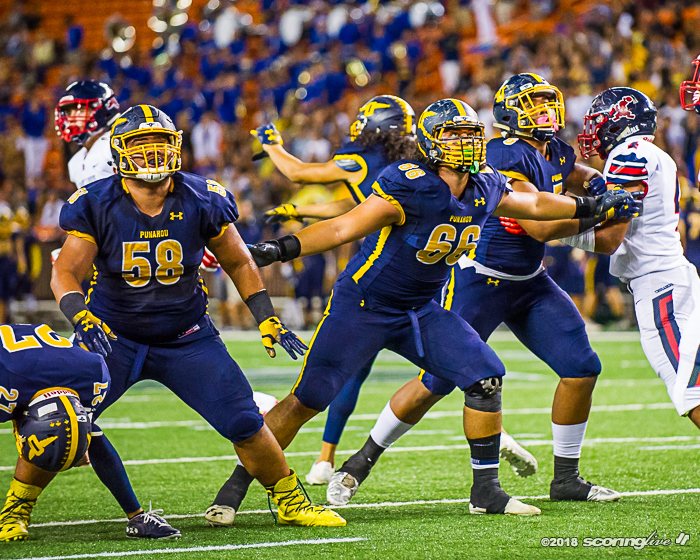 We were a little bit slow sometimes getting into coverages and what not and they protected. 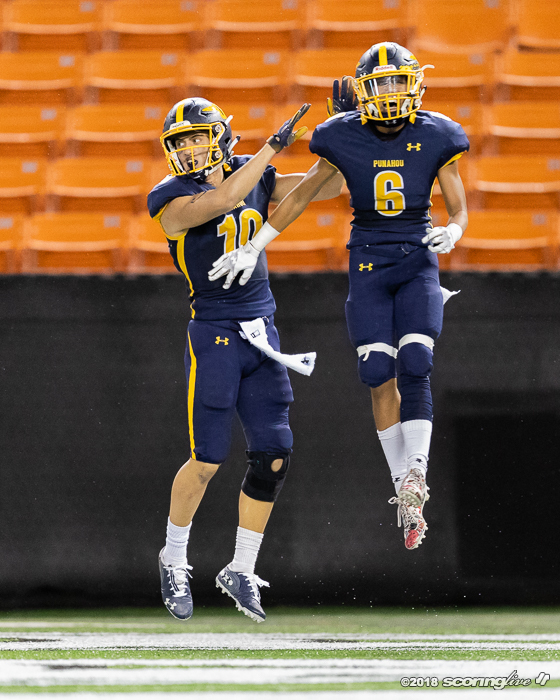 Their offense really responded and they ran the ball well, as well, so they did a good job," Punahou coach Kale Ane said of the Crusaders. 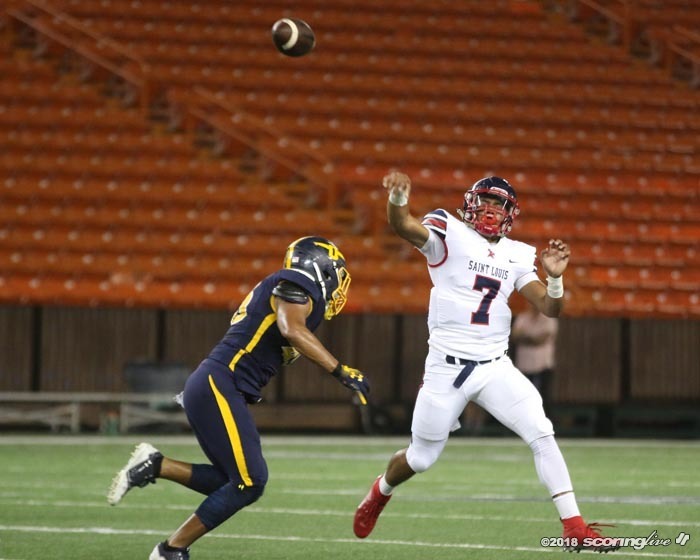 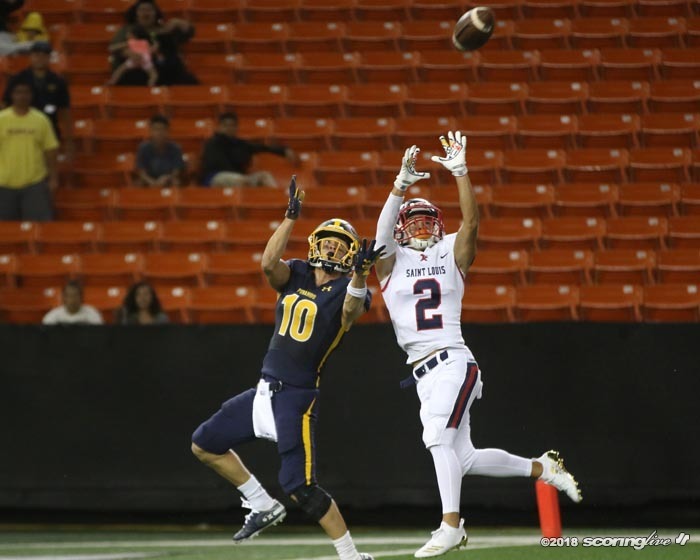 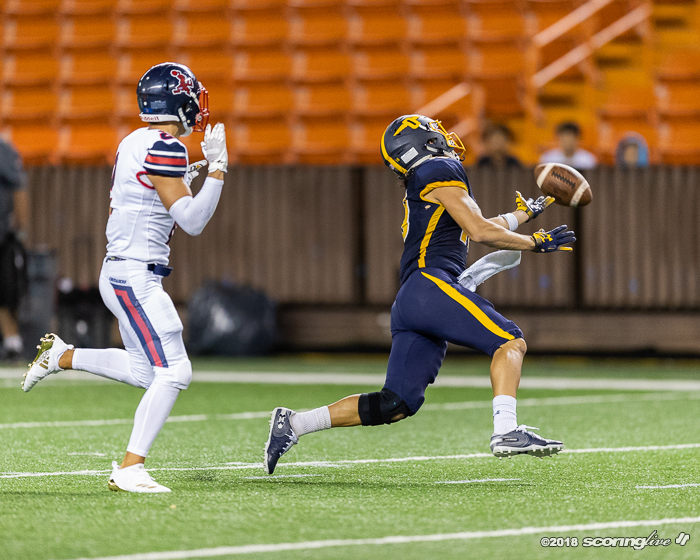 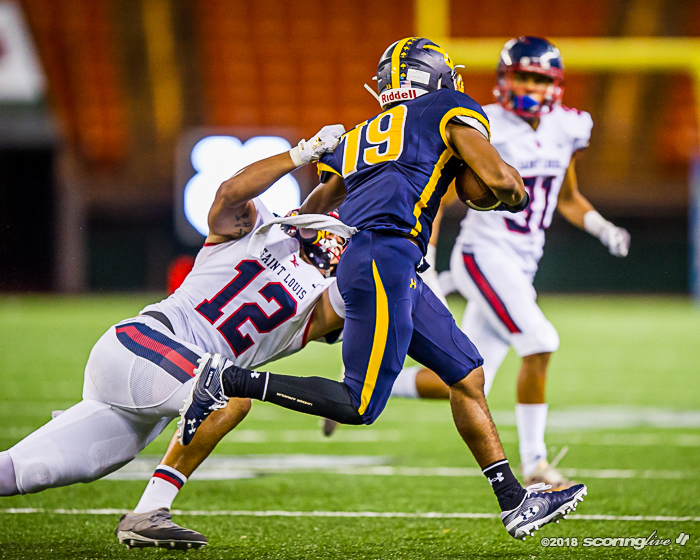 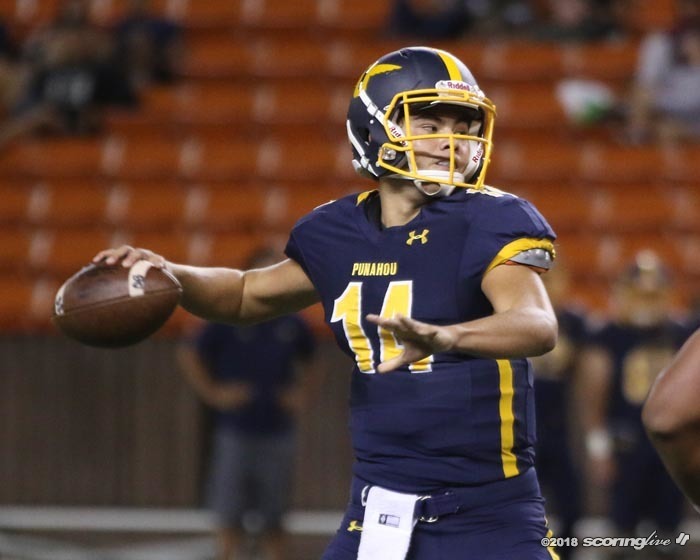 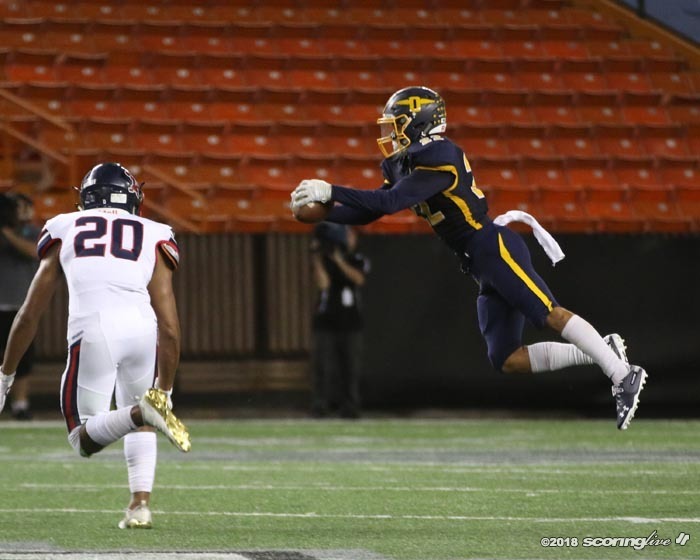 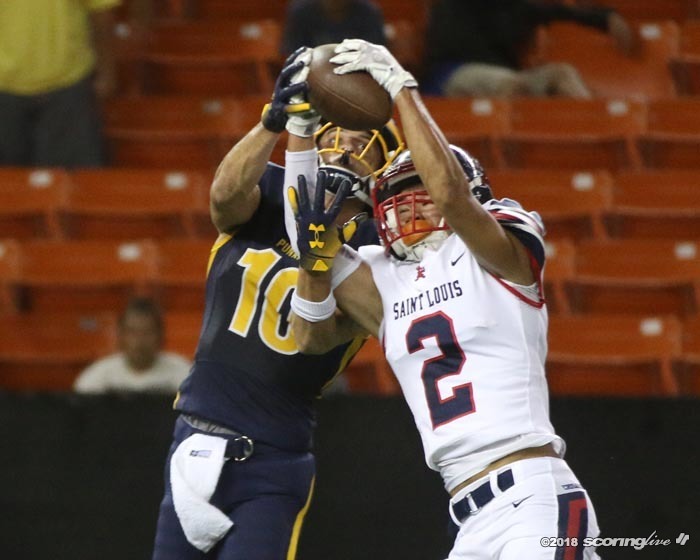 Punahou took a 7-0 lead on Brady's 9-yard TD pass to Dancil-Evans early in the first quarter, but Saint Louis tied it with a 2-yard Robbie Paikai TD run later in the period. 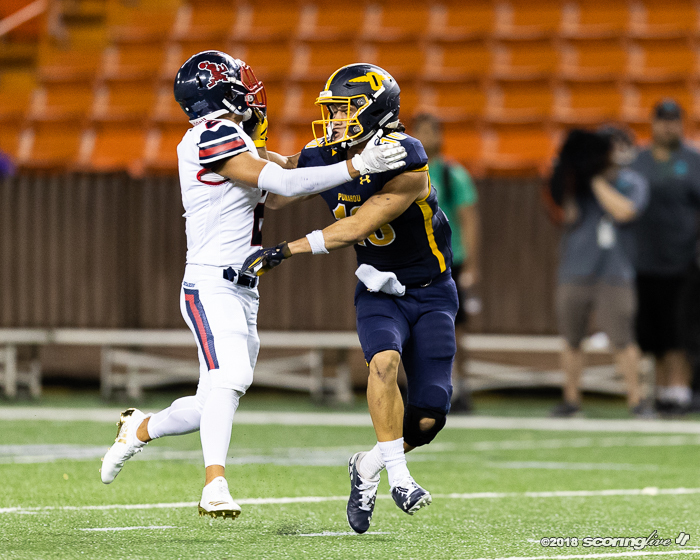 On the first play of the second quarter, Kainalu Puu-Robinson blocked a Saint Louis punt, which was recovered by Trent Shiraki in the end zone to reclaim the lead at 14-7. 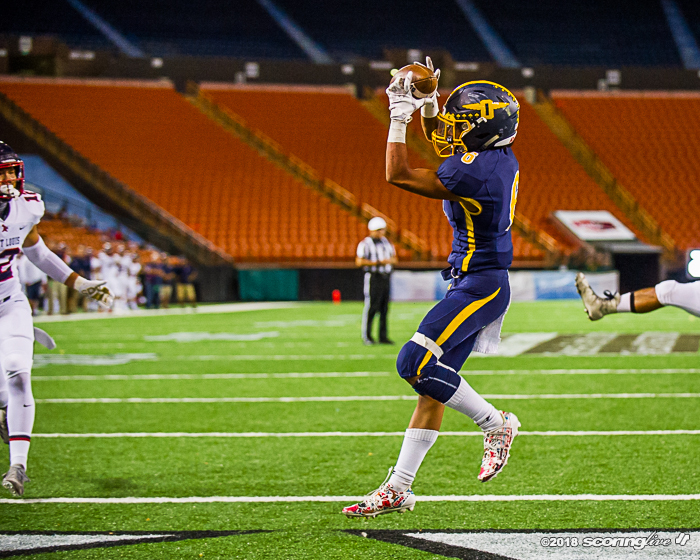 Two plays later, de Laura hit a streaking Roman Wilson in stride for an 80-yard TD pass. 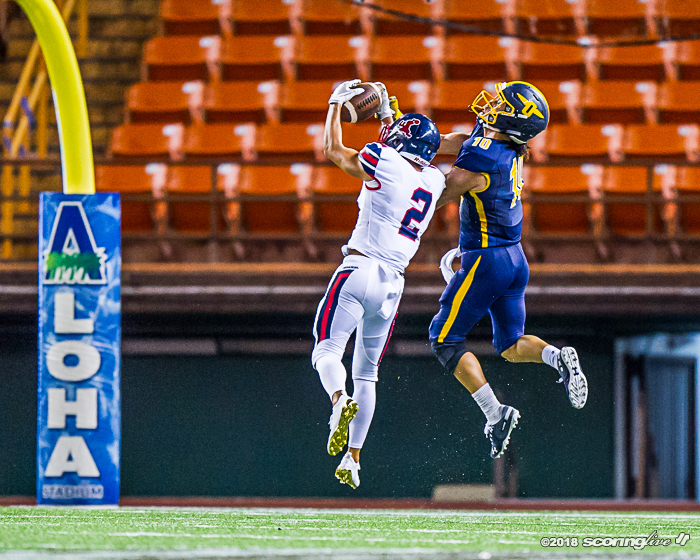 Napuunoa's PAT tied the score at 14-all. 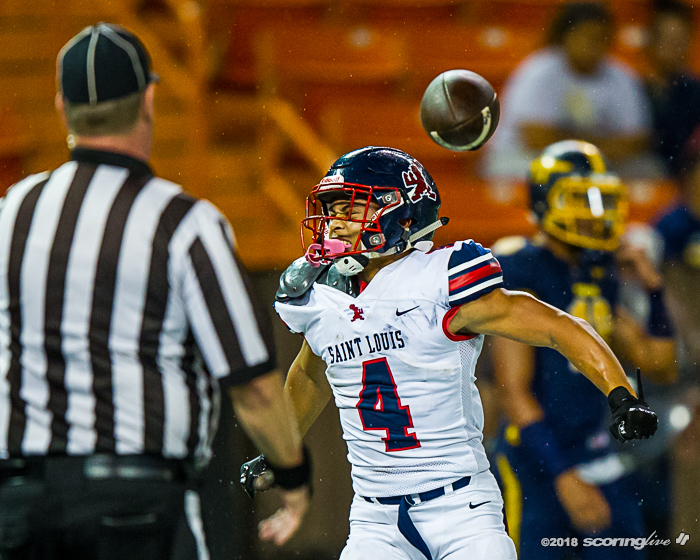 The Buffanblu pulled back ahead with Brady's 66-yard scoring strike to Falatea with 10:57 left in the second quarter, but Saint Louis tied it at 21 on de Laura's 5-yard quarterback draw up the middle with 24 seconds until halftime. 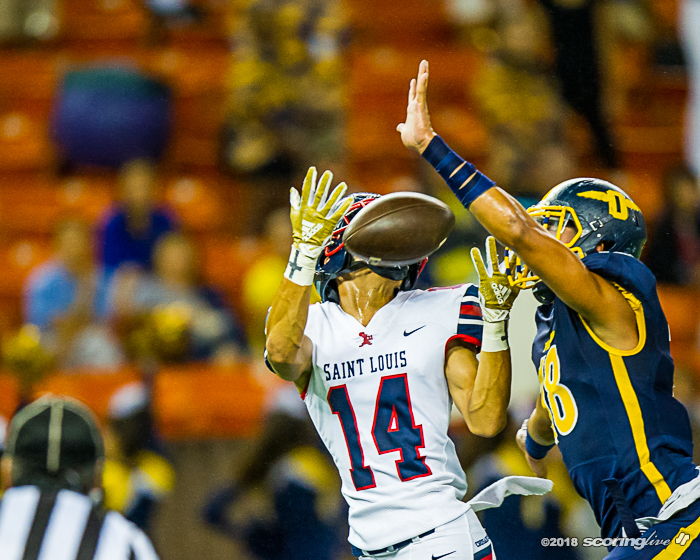 The scoring play was set-up by a Brian Cox interception five plays prior. 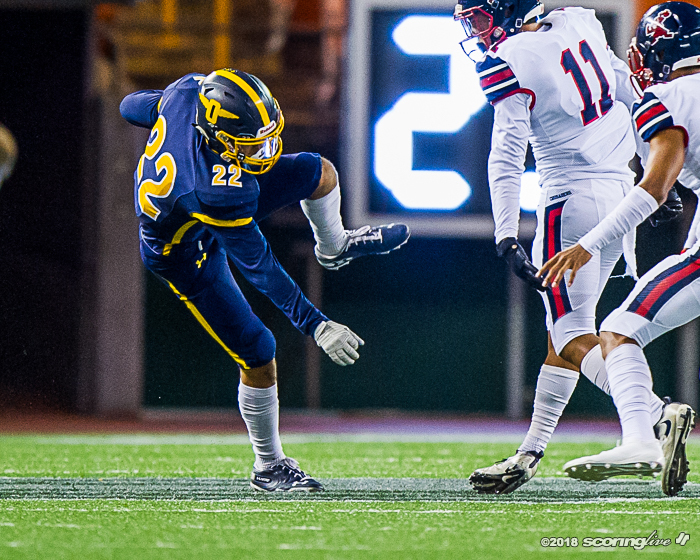 Horn had his 49-yard field goal attempt hit the right upright on the final play of the first half. 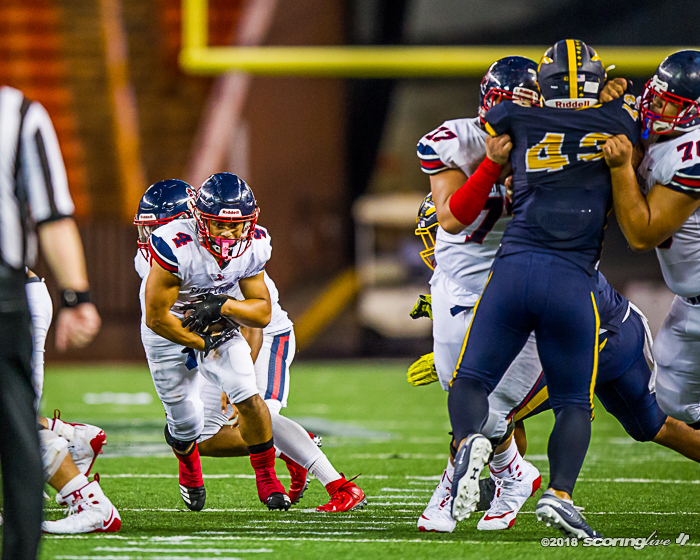 Saint Louis finished with 451 yards of total offense. 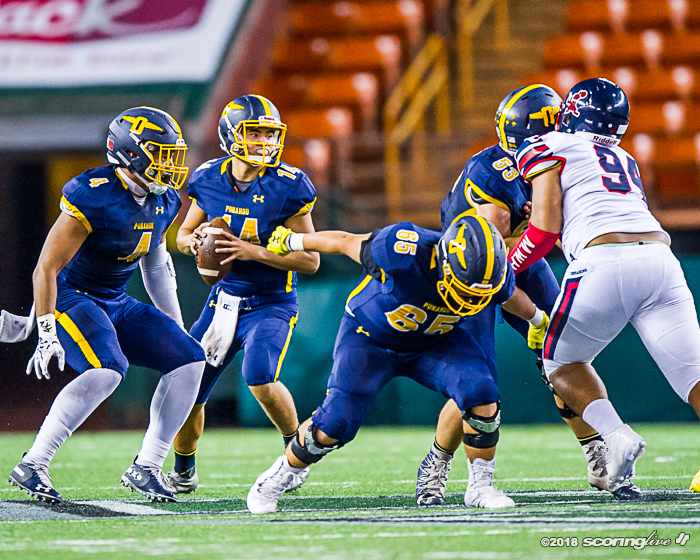 De Laura completed 19 of his 32 pass attempts for 293 yards with four interceptions, but he ran 17 times for a game-high 84 yards. 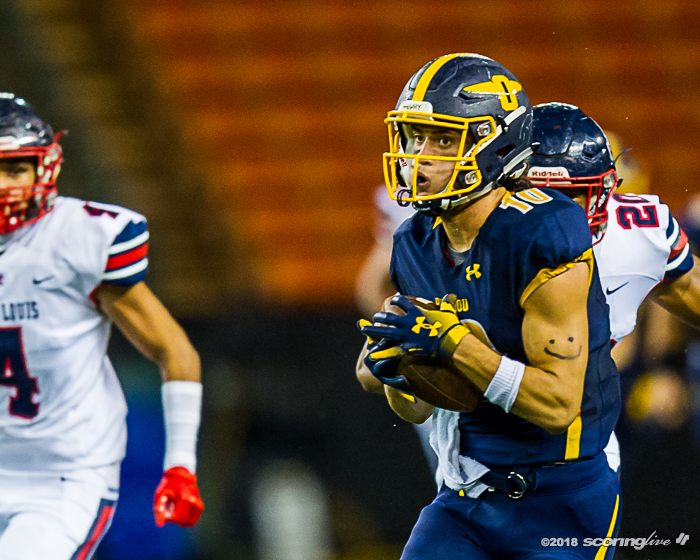 Chance Beyer hauled in 10 catches for 115 yards and Wilson added four grabs for 142 yards. 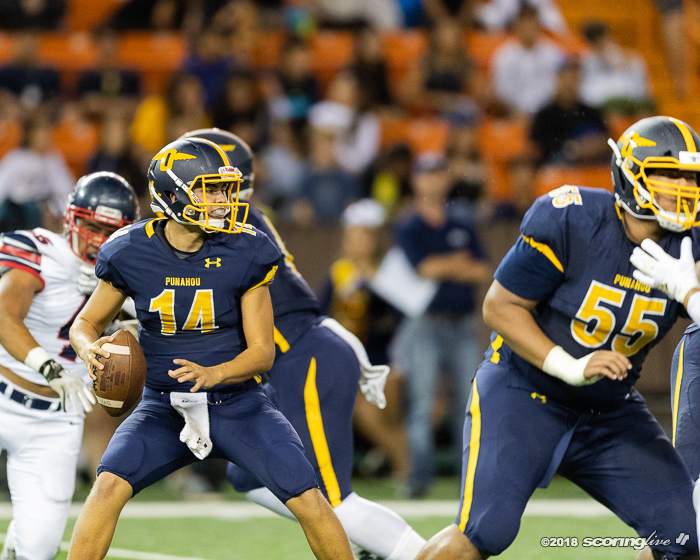 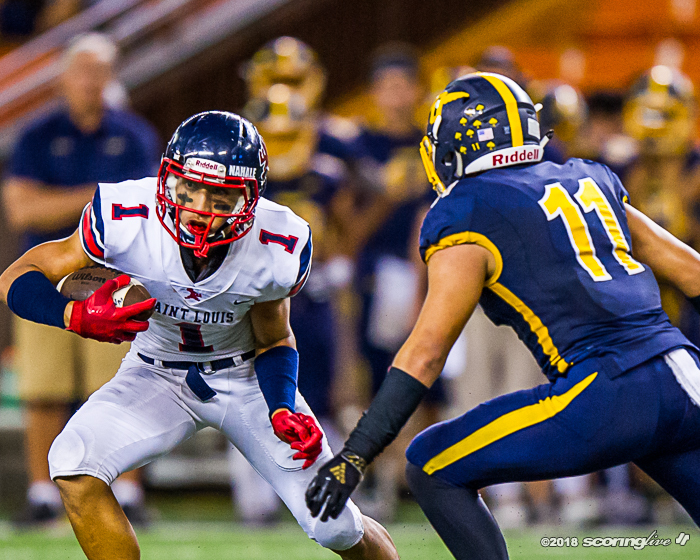 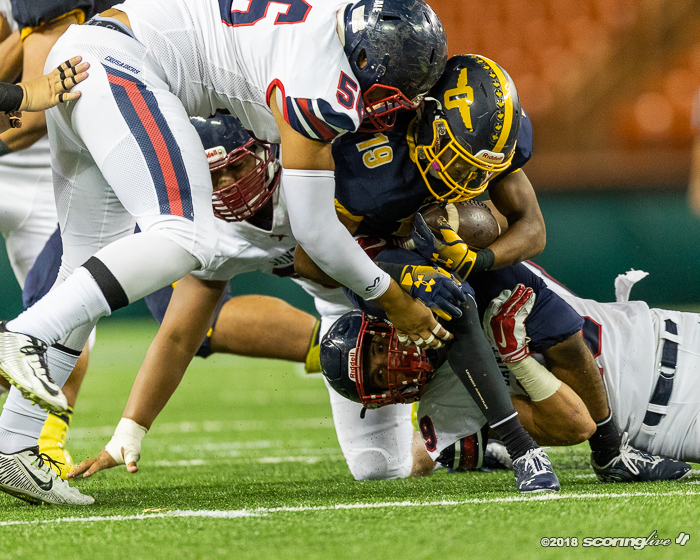 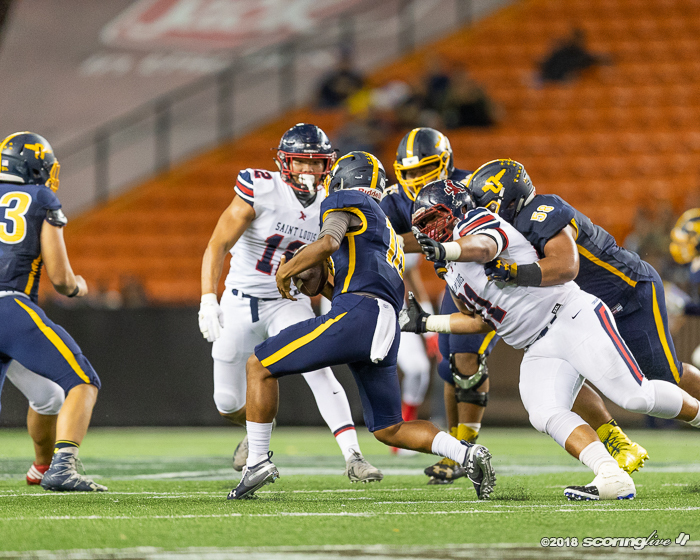 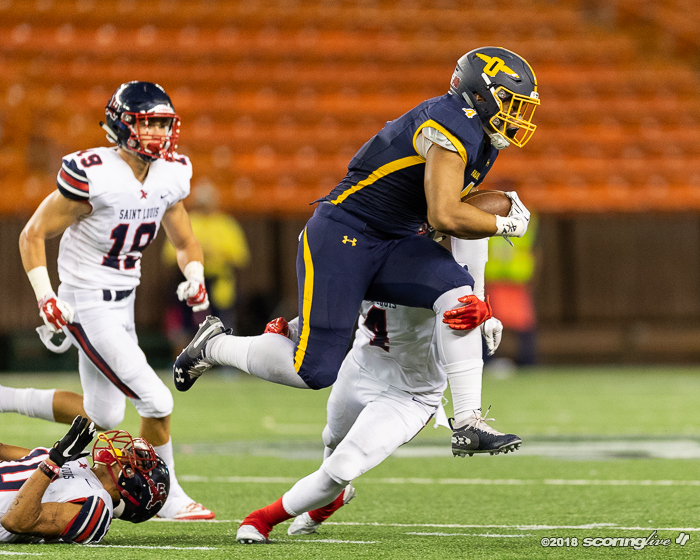 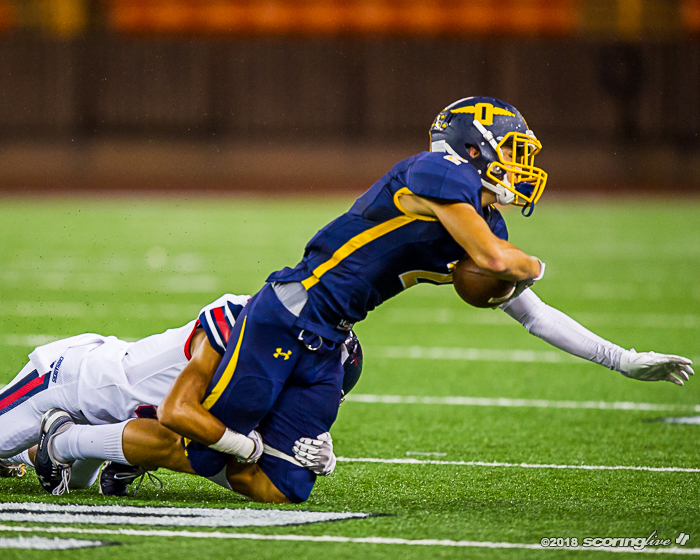 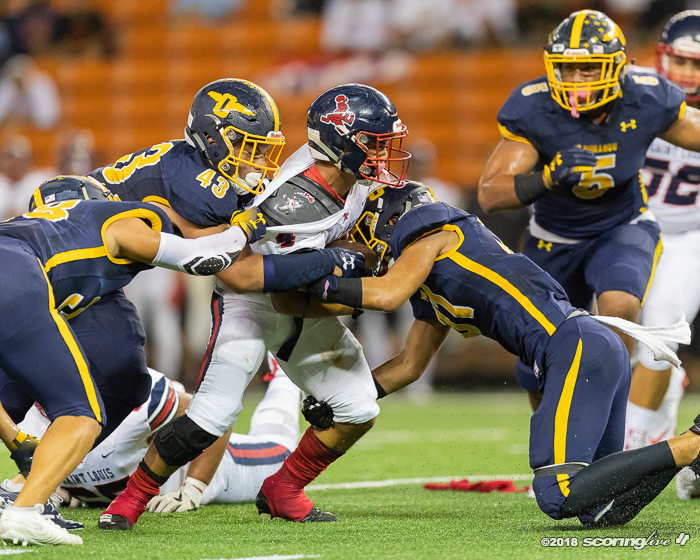 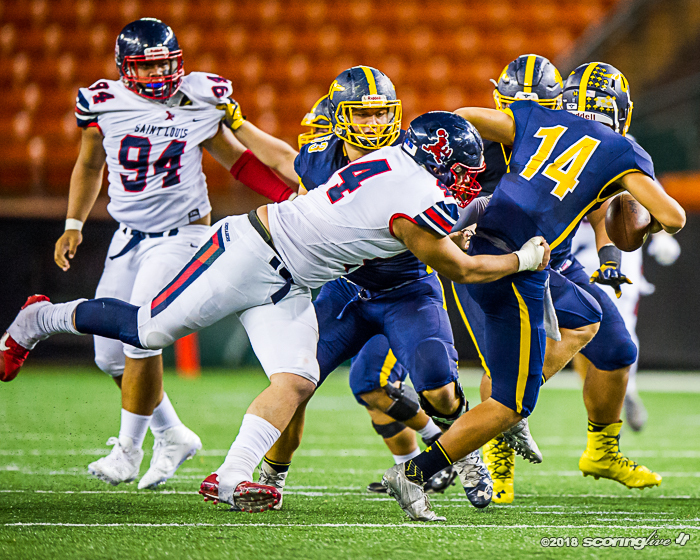 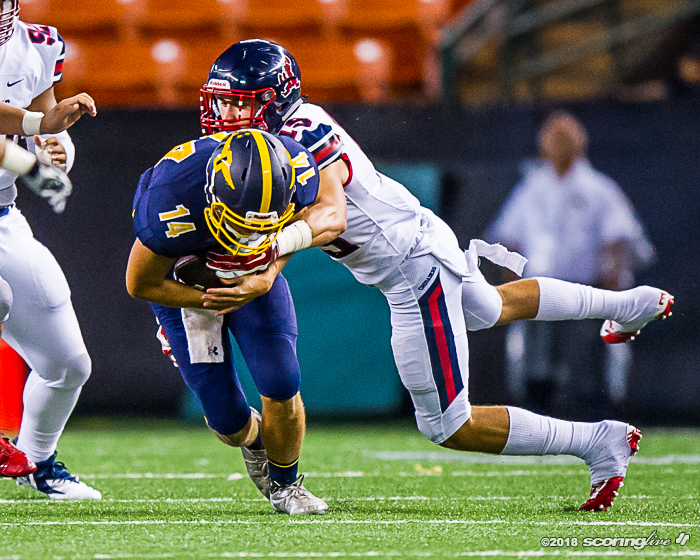 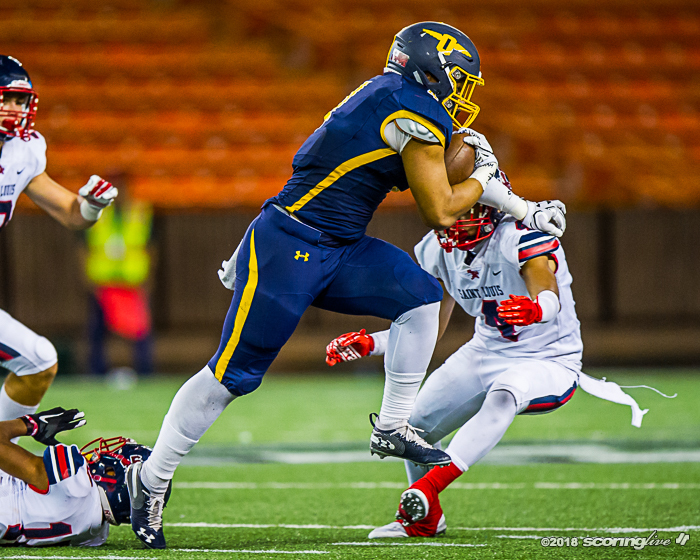 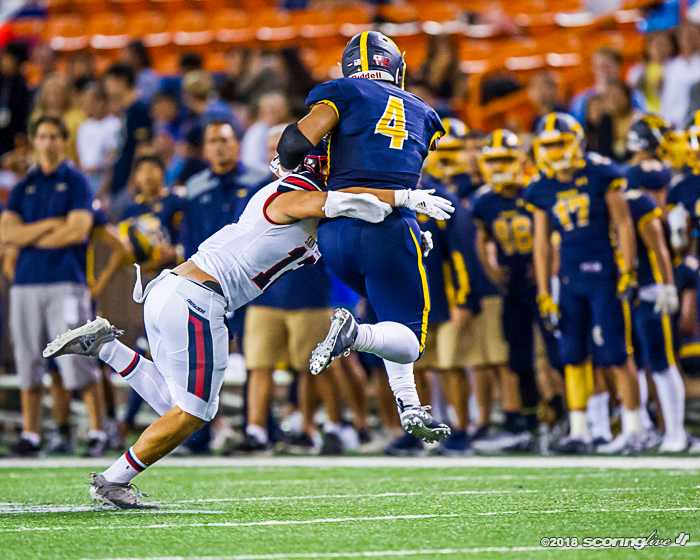 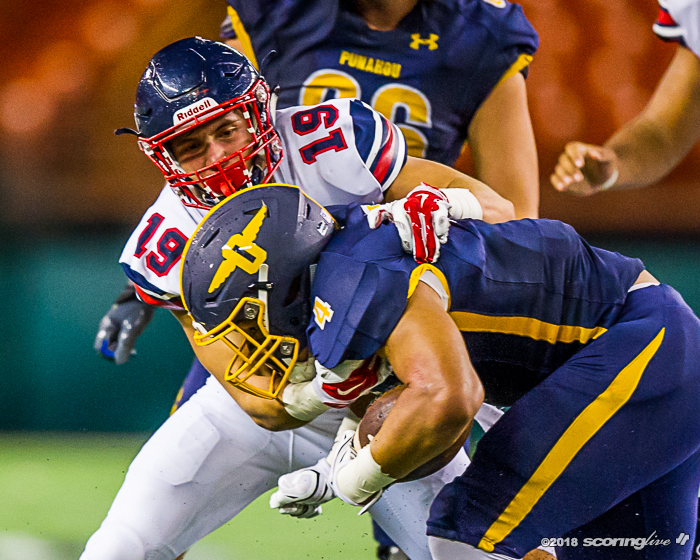 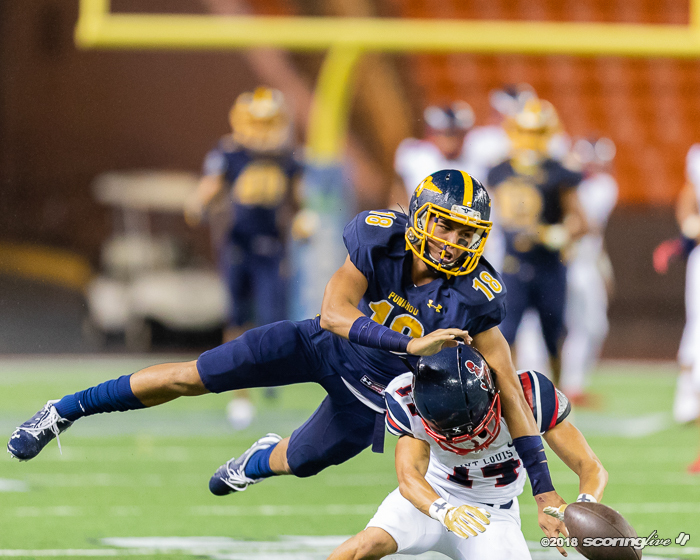 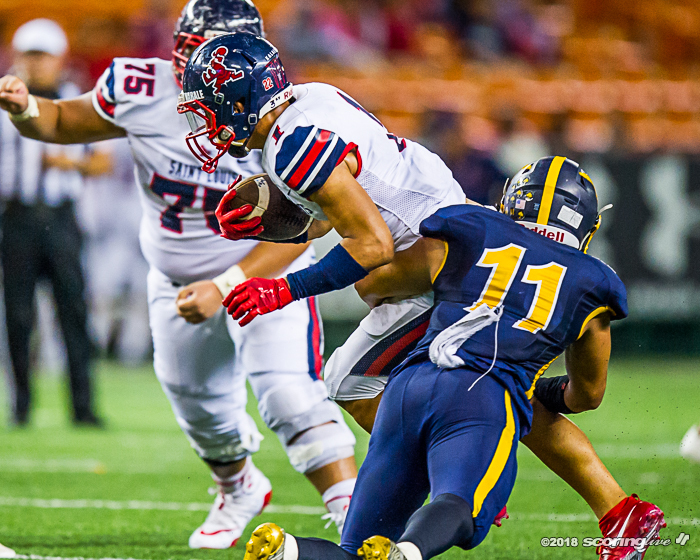 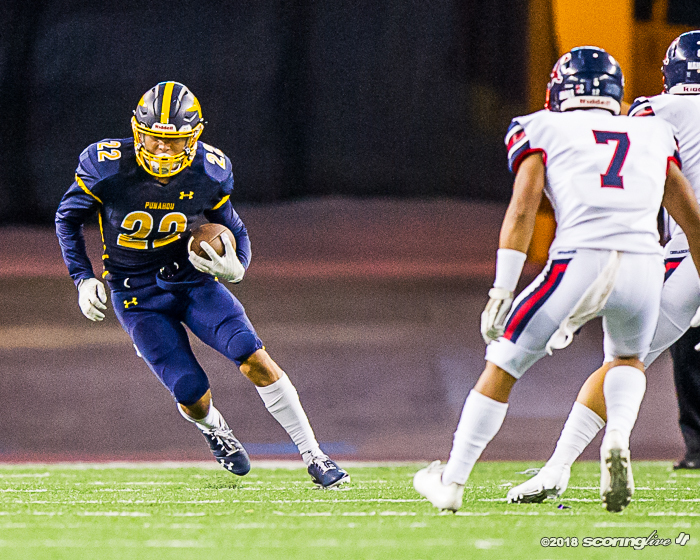 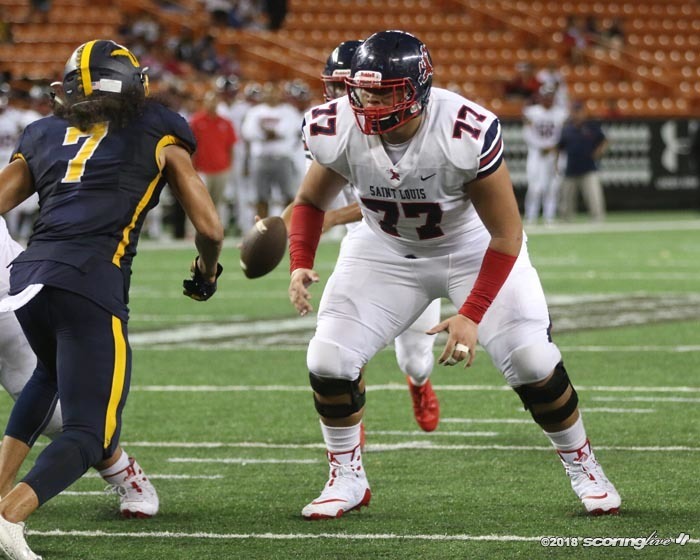 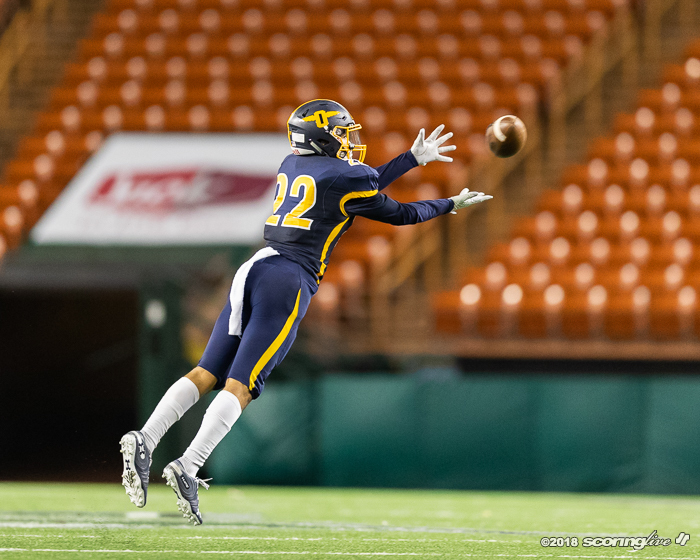 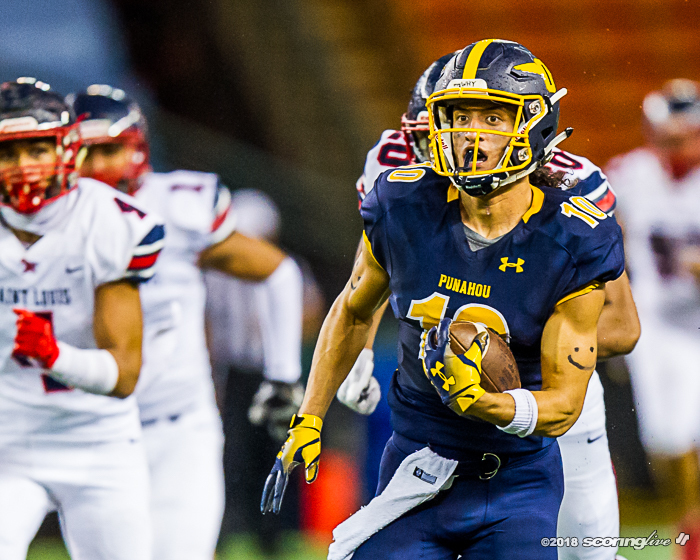 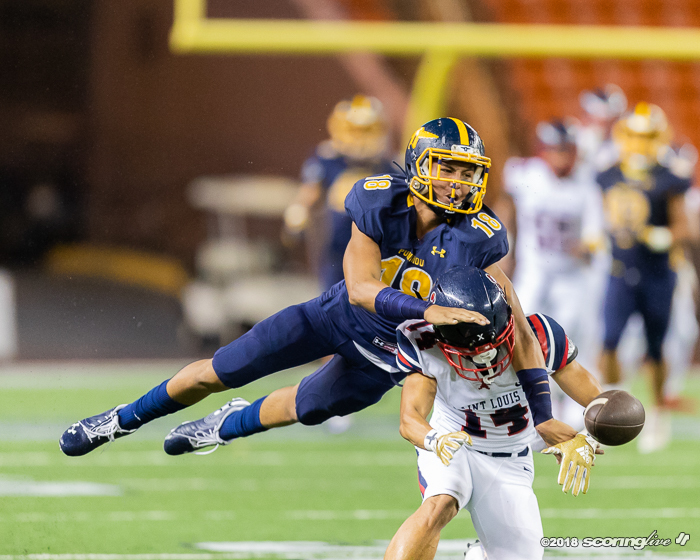 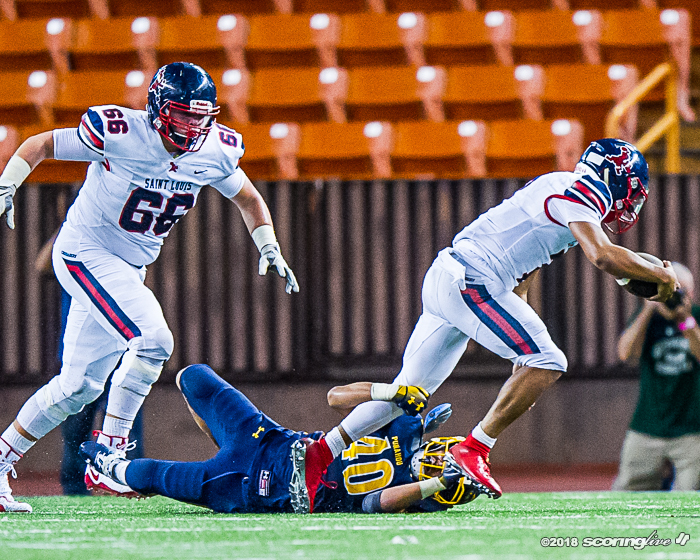 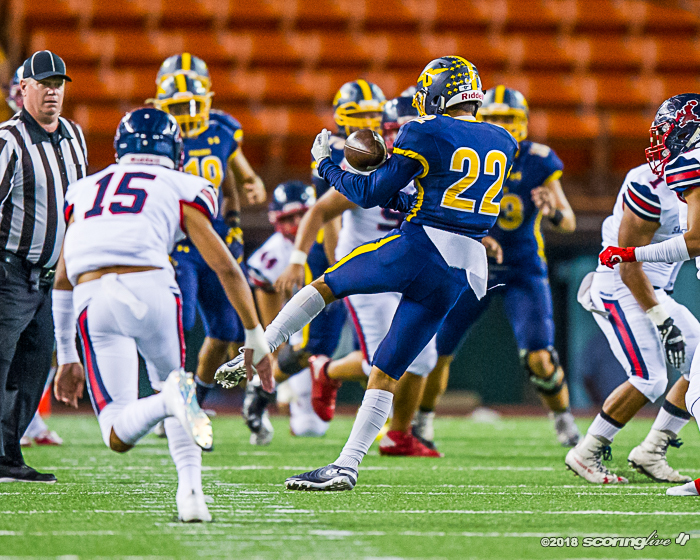 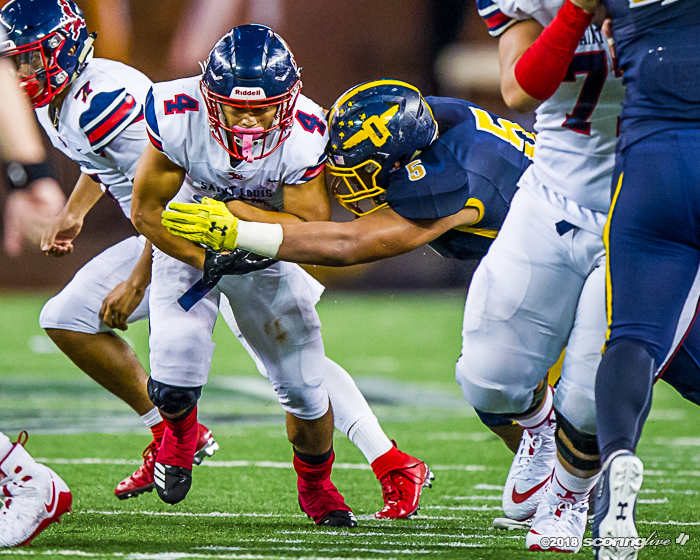 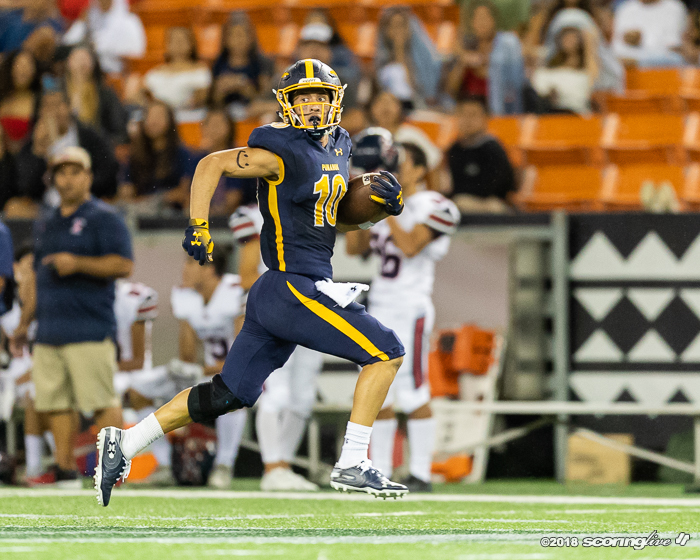 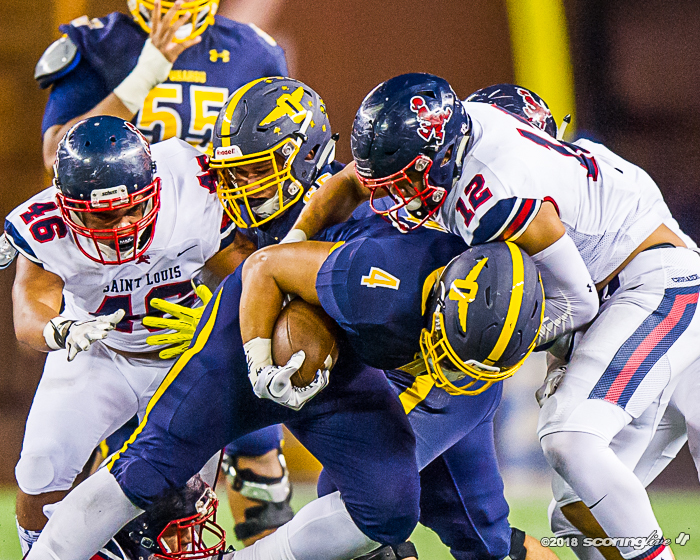 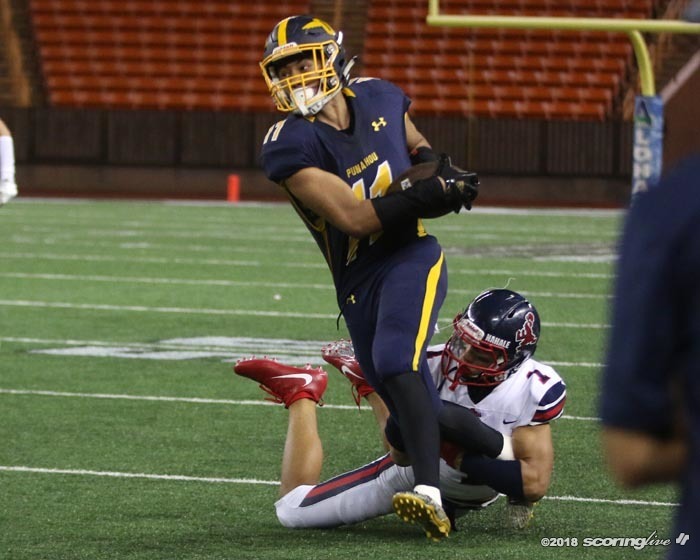 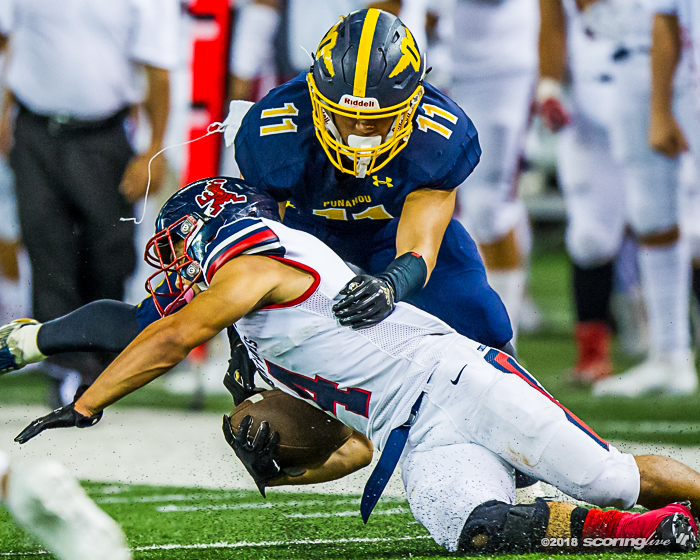 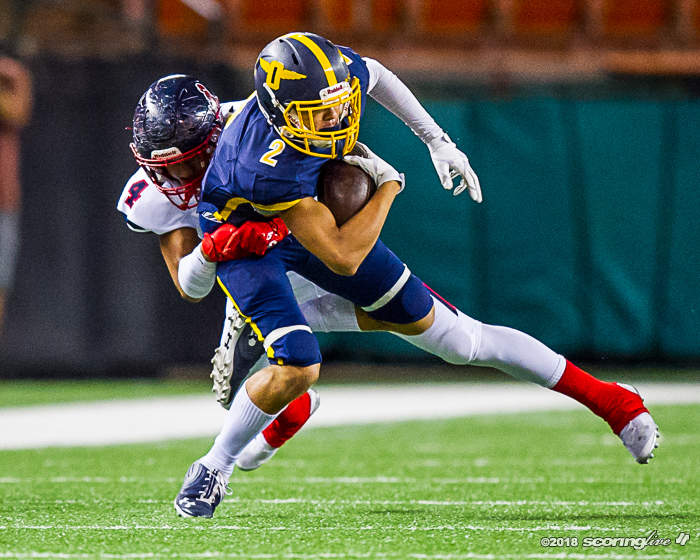 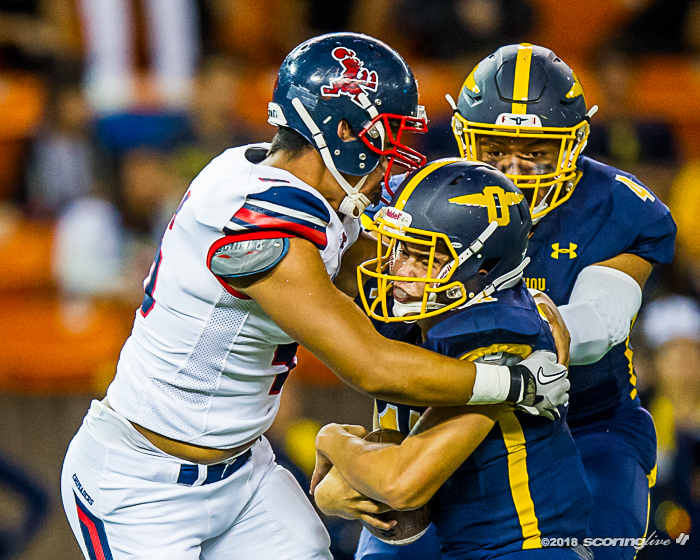 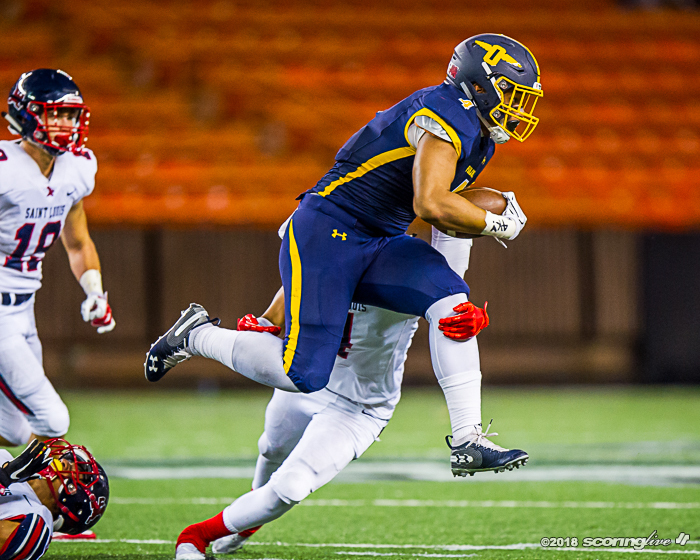 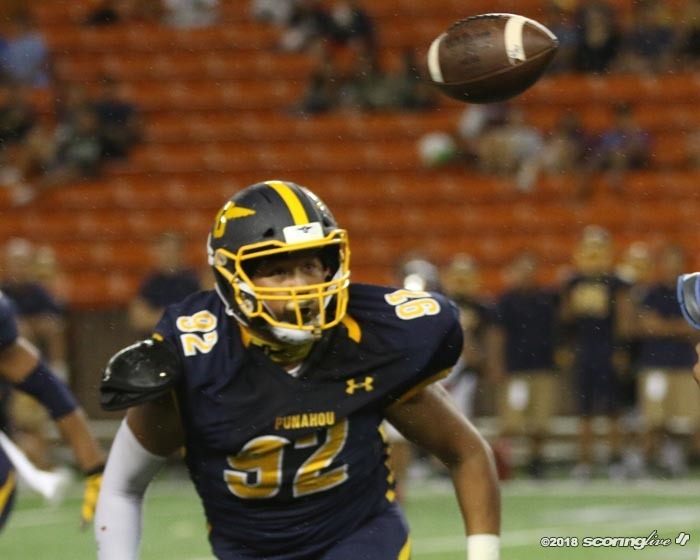 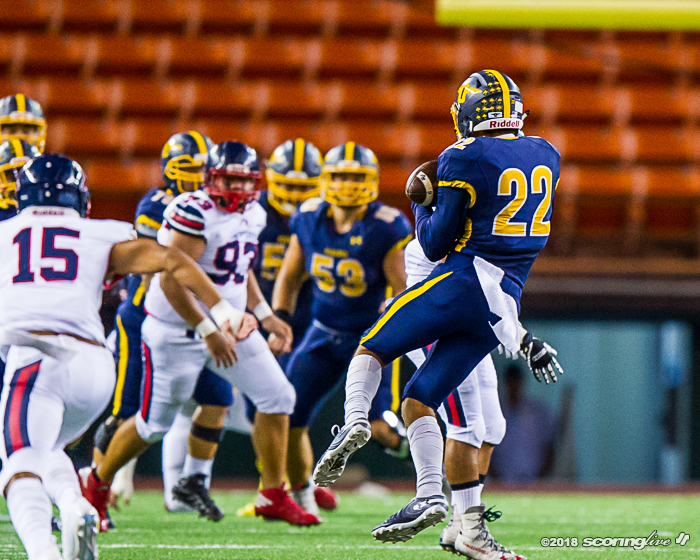 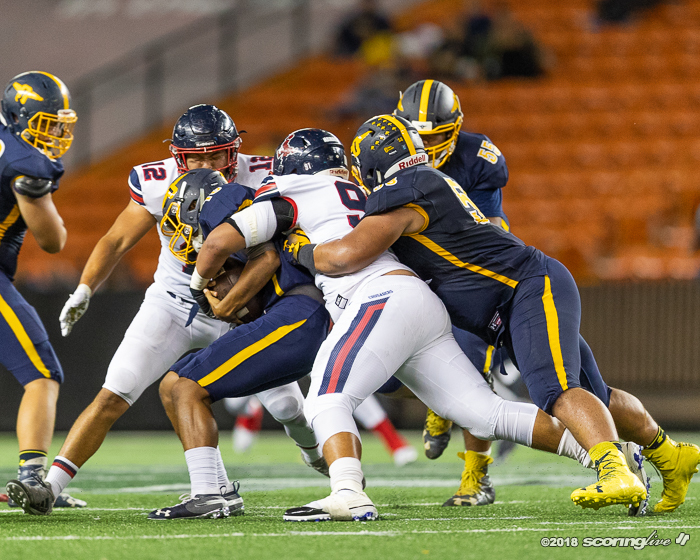 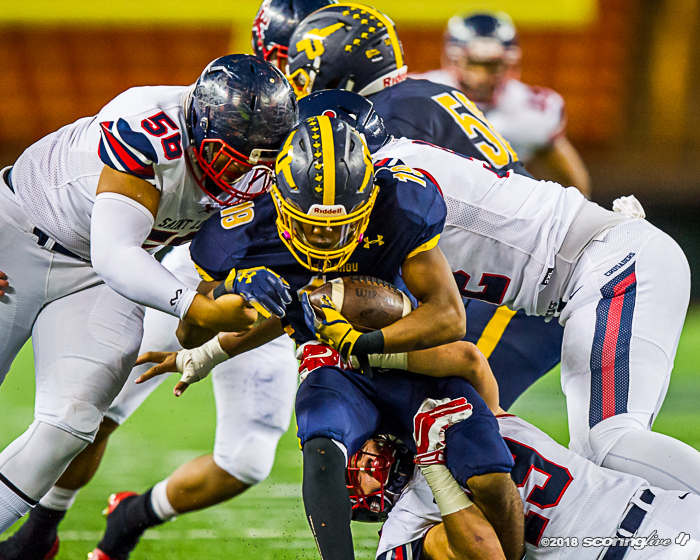 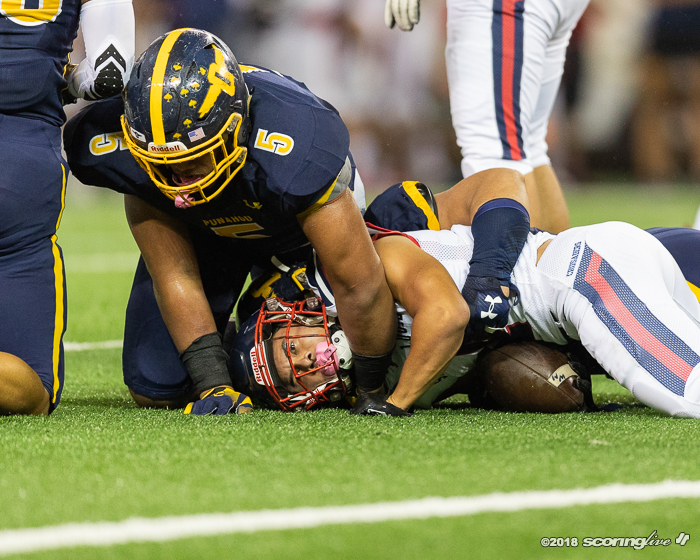 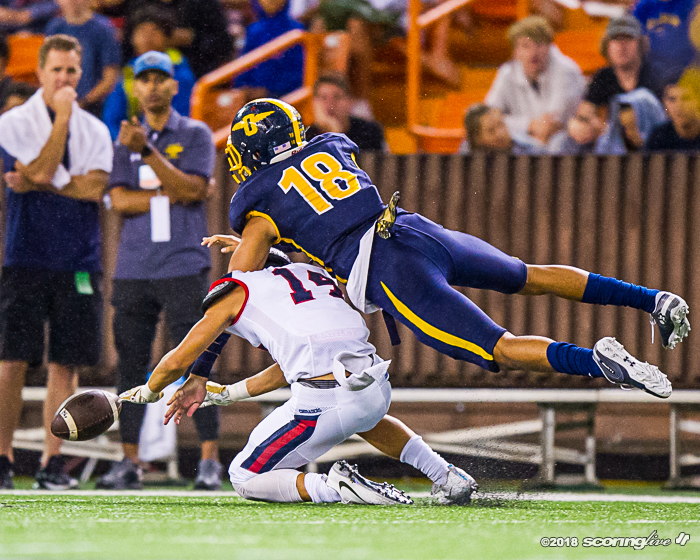 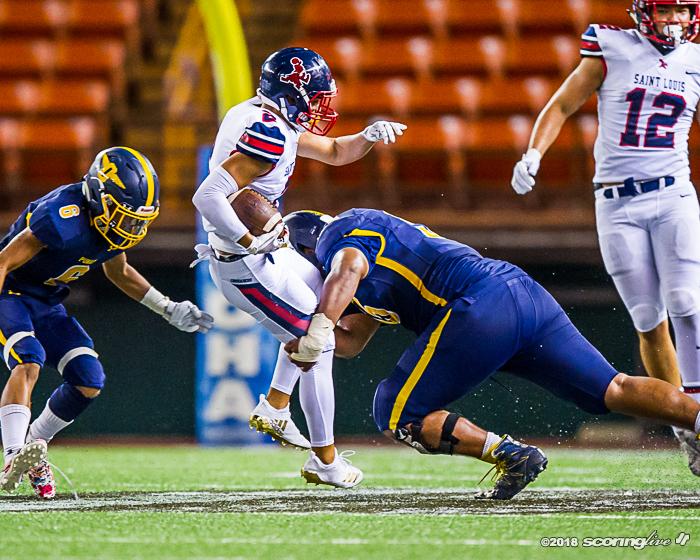 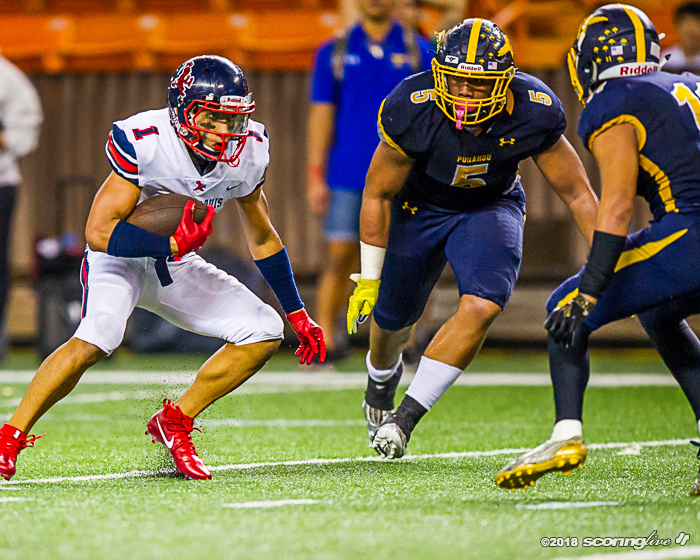 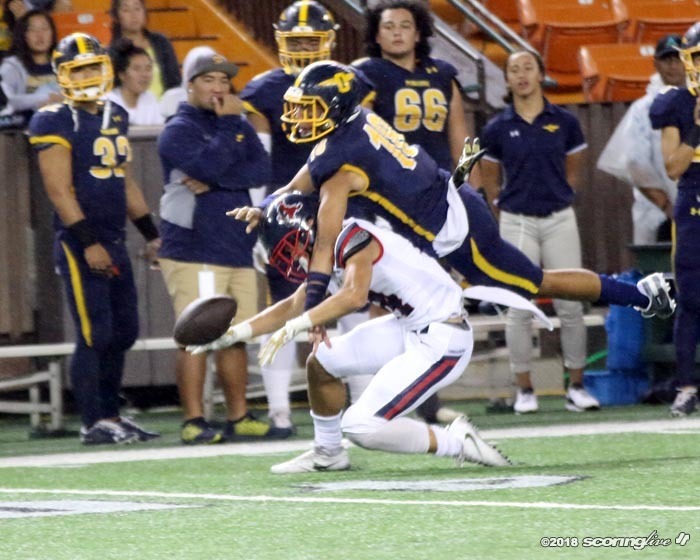 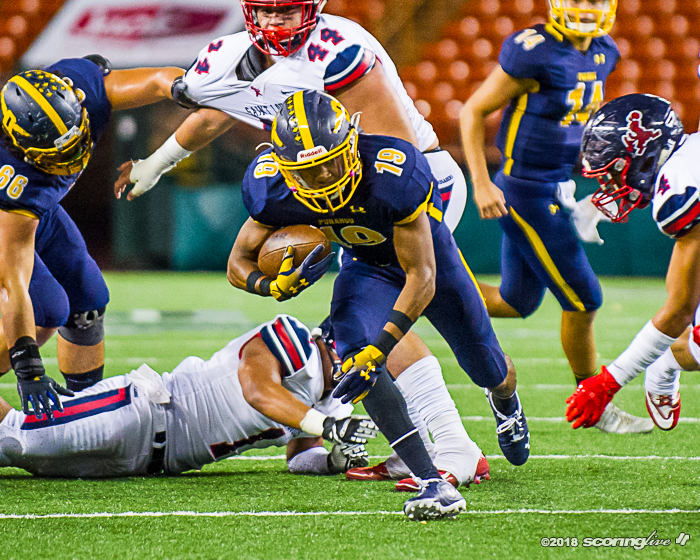 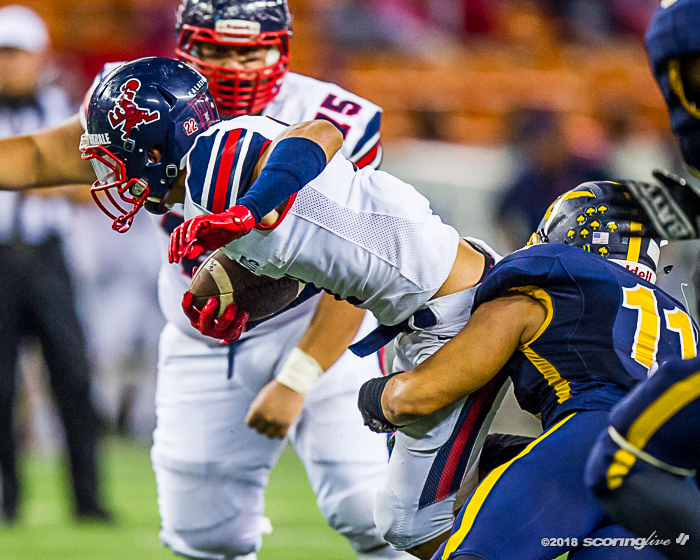 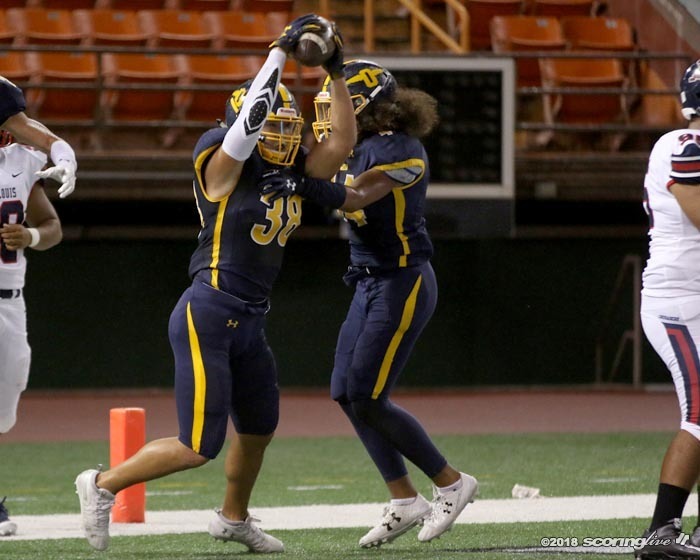 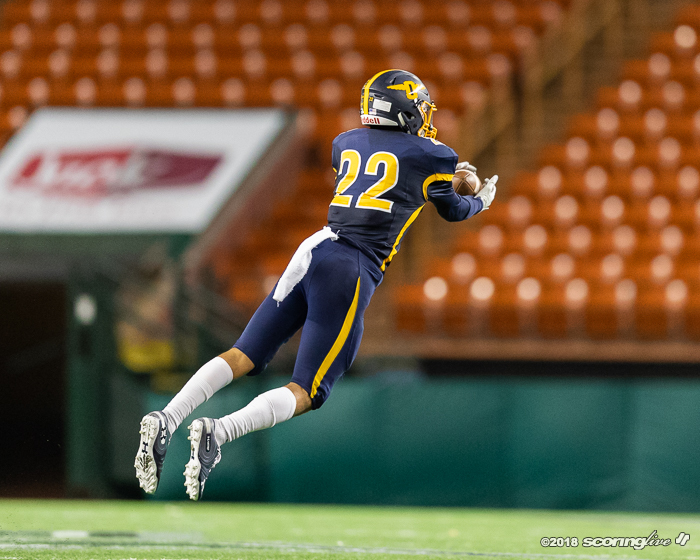 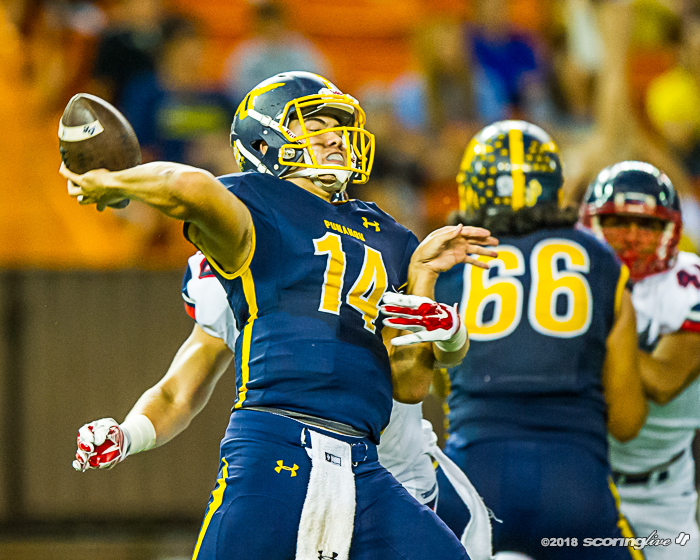 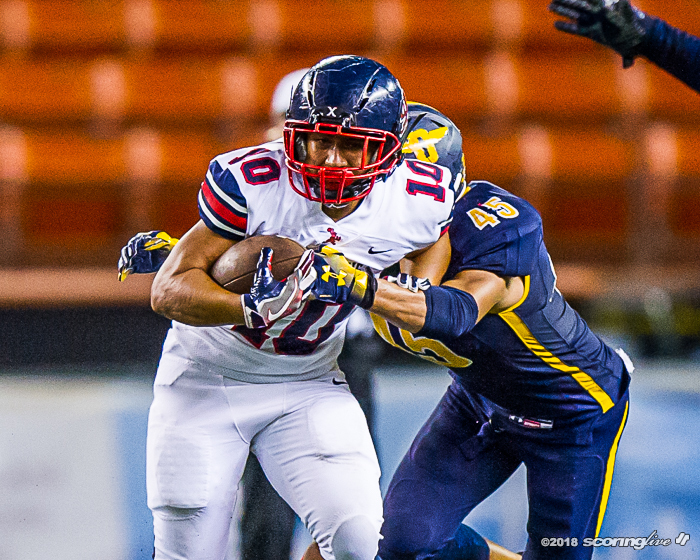 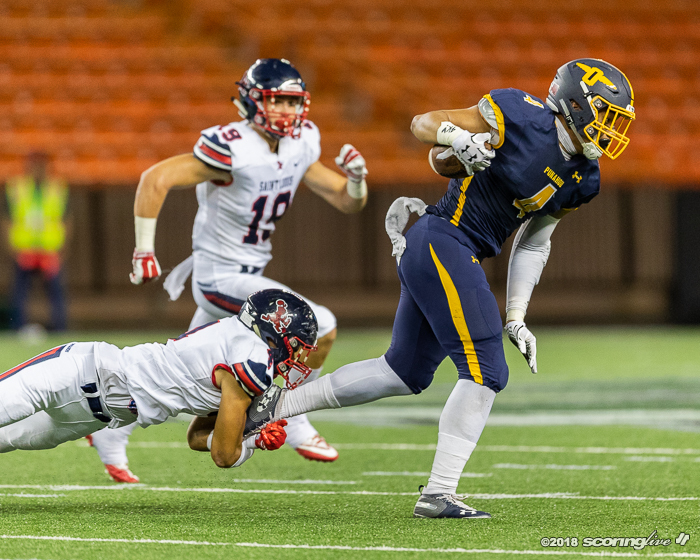 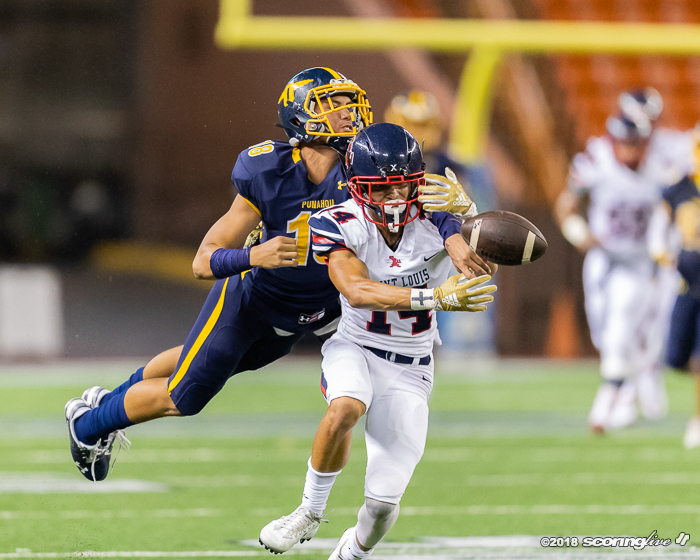 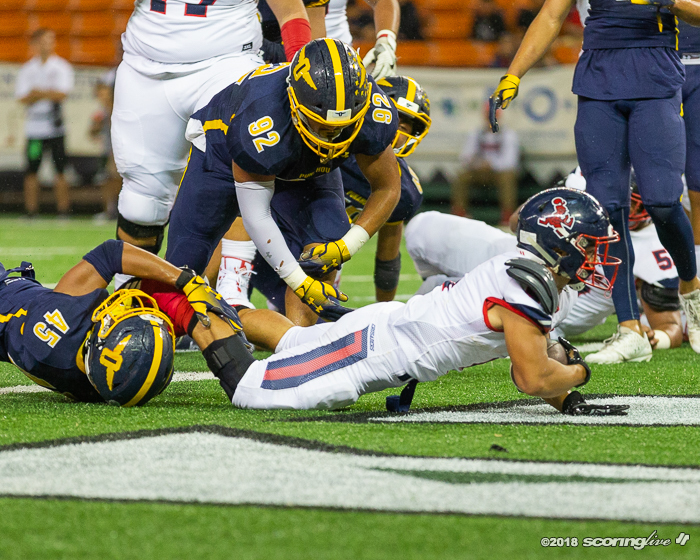 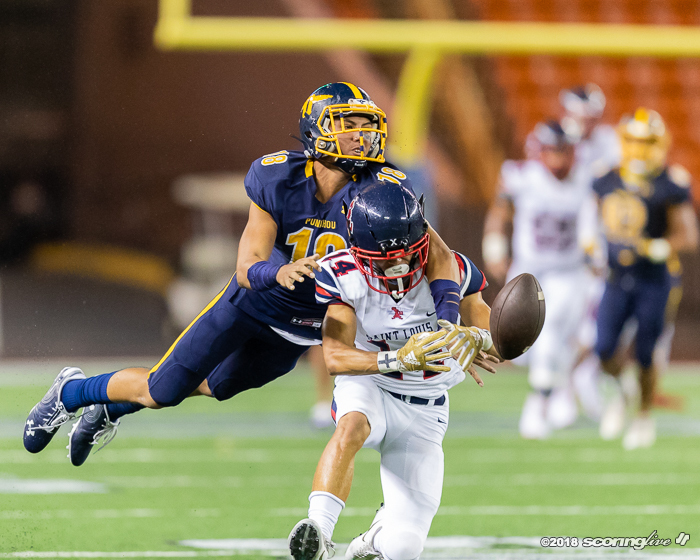 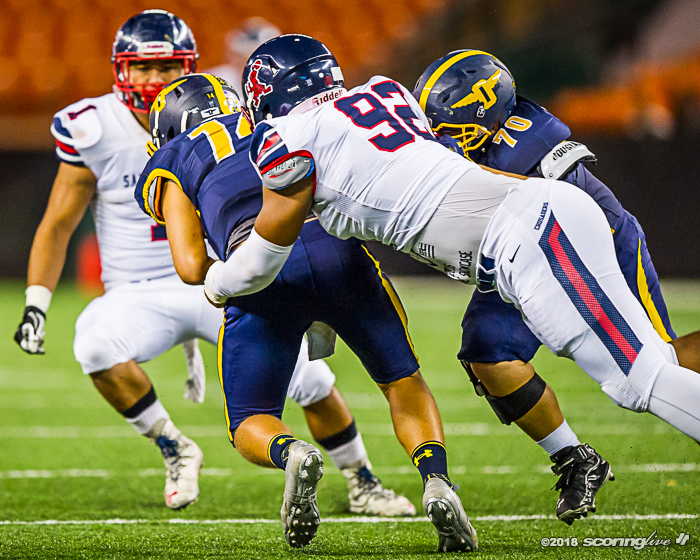 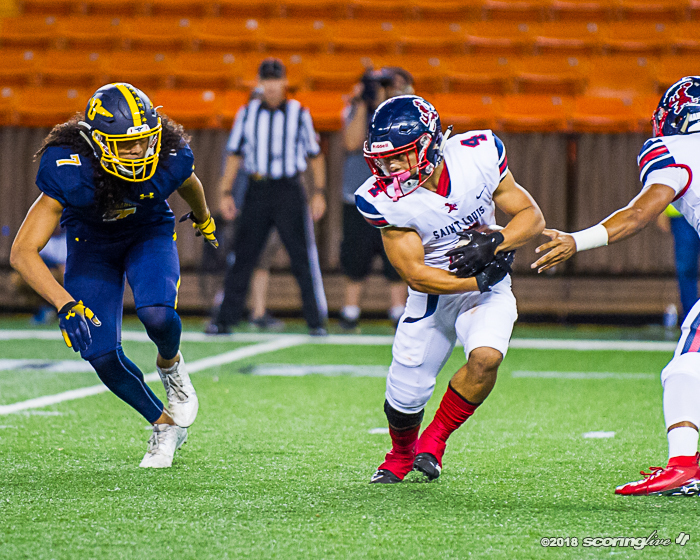 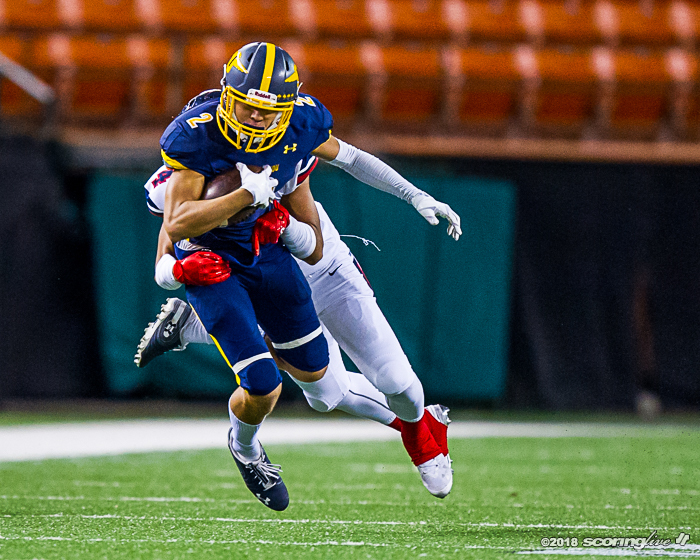 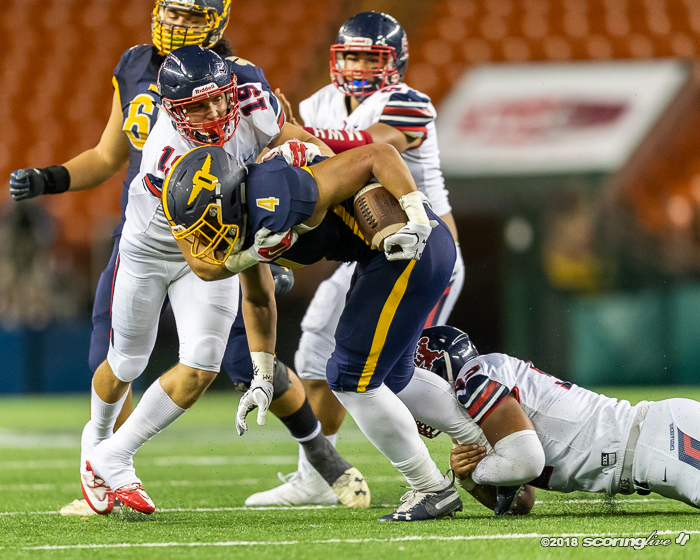 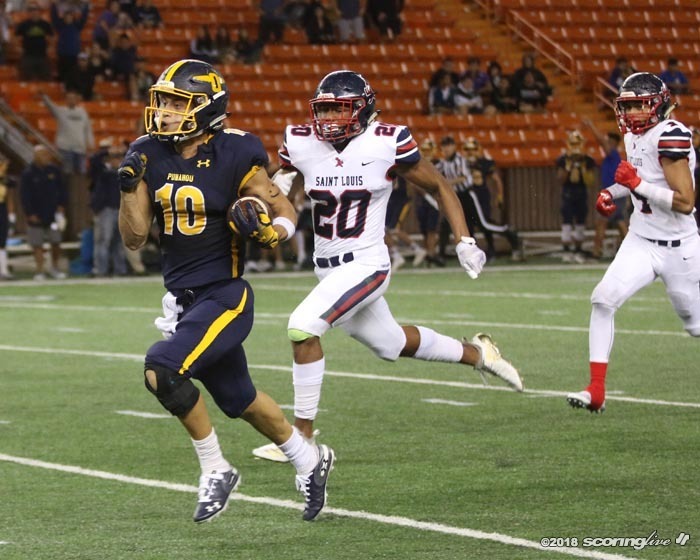 Alakai Gilman led Punahou defensive with a game-high 12 tackles. 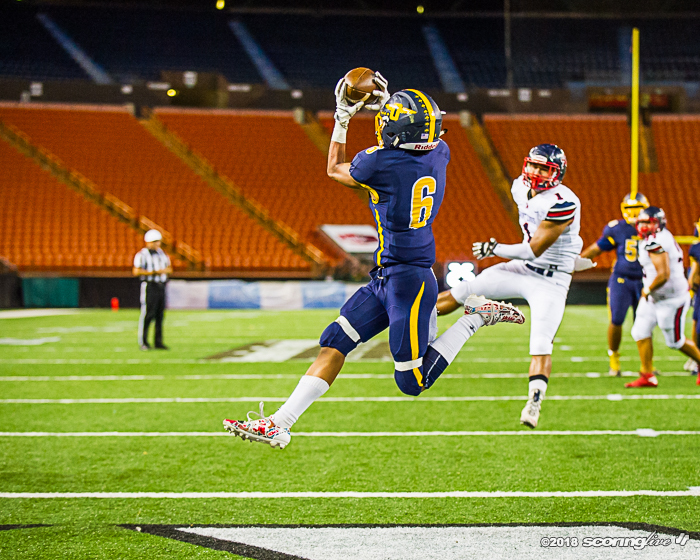 He also intercepted a pair of passes off de Laura in the first half. 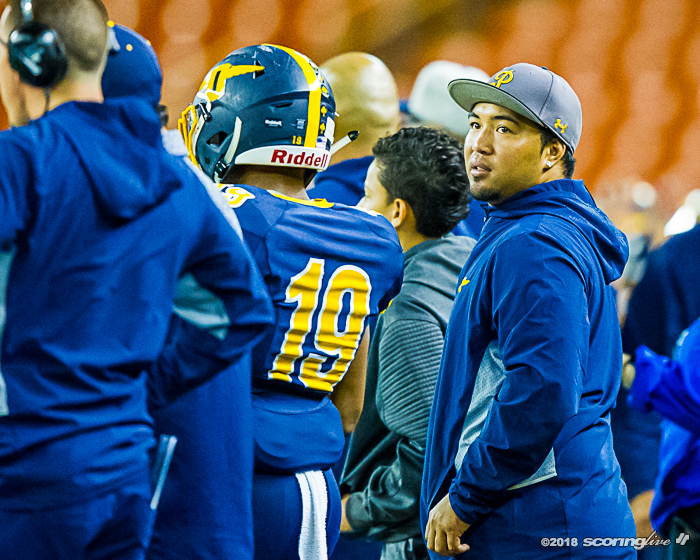 "It was a learning experience," Tuitele said. 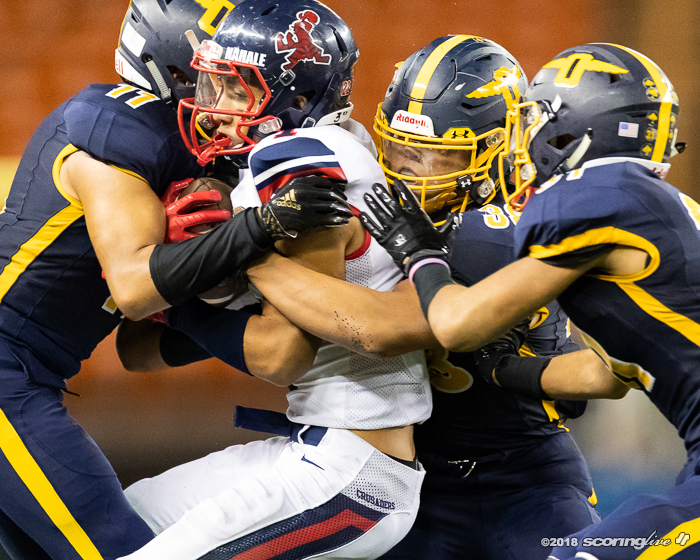 "Both sides of the ball we kind of started slow, but the second half came and that's kind of where we live, in the second half, but we just gotta come out stronger on D, make a statement, start off strong and get that momentum going." 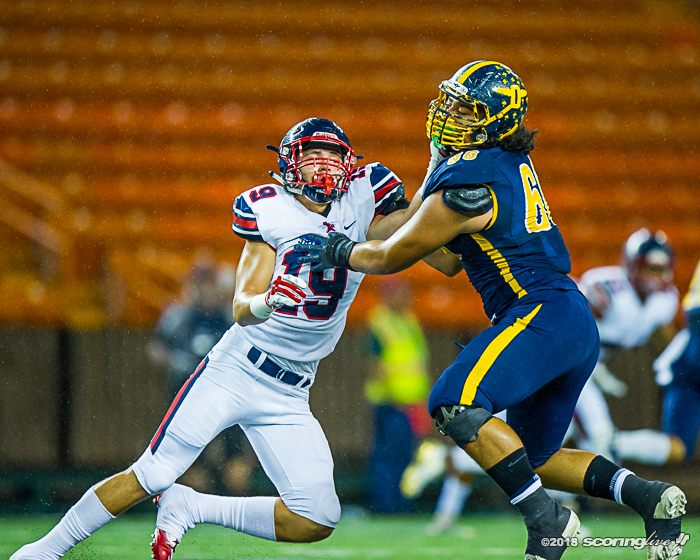 Ane said it also a learning experience for the Buffanblu. 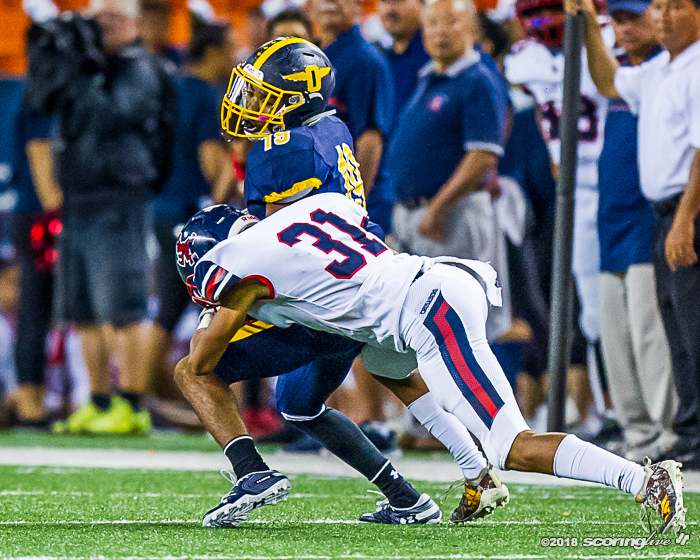 "You always learn a lot about yourself whether you win or lose. 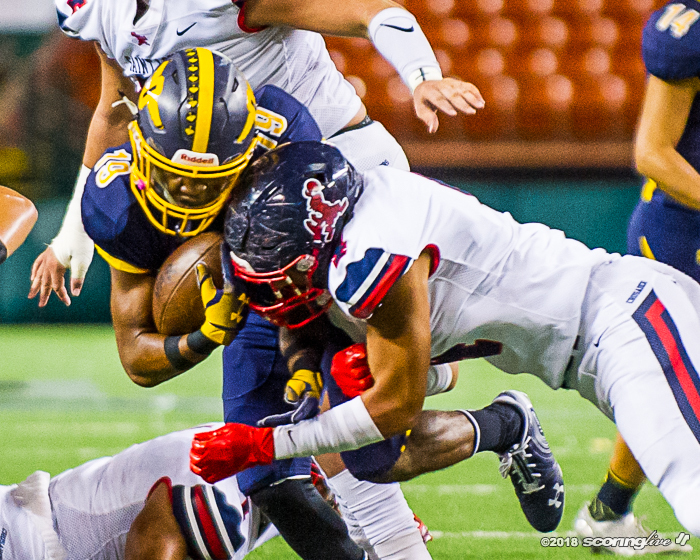 You hope that you can learn as much when you win, but you know, Hugh stuck in there, got hurt, came back and played. 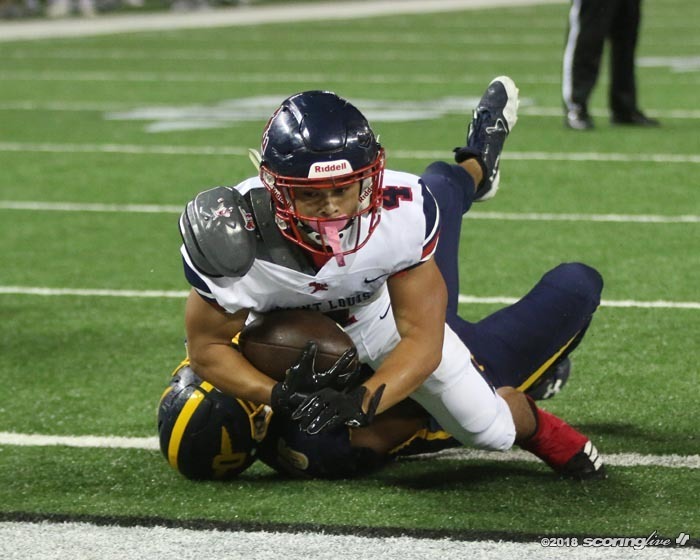 We had a chance right up to the very end. 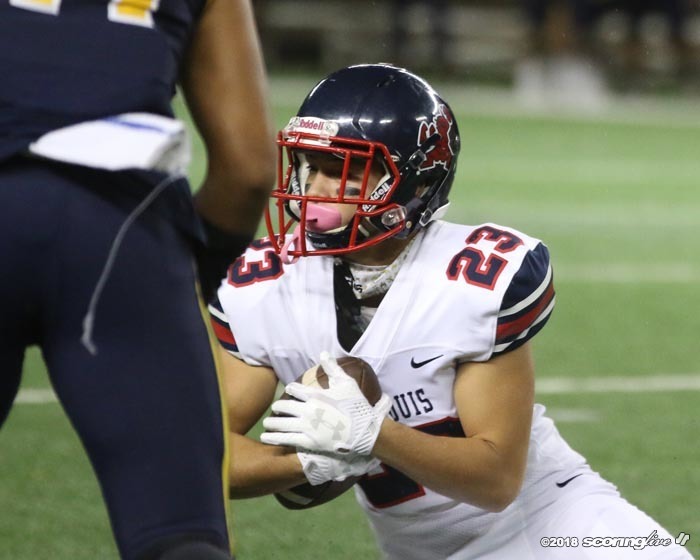 We didn't capitalize on a couple of things, but again, iIt's a very good team, nationally ranked, and we gave them everything we could handle, so I'm proud of our guys," Ane said. 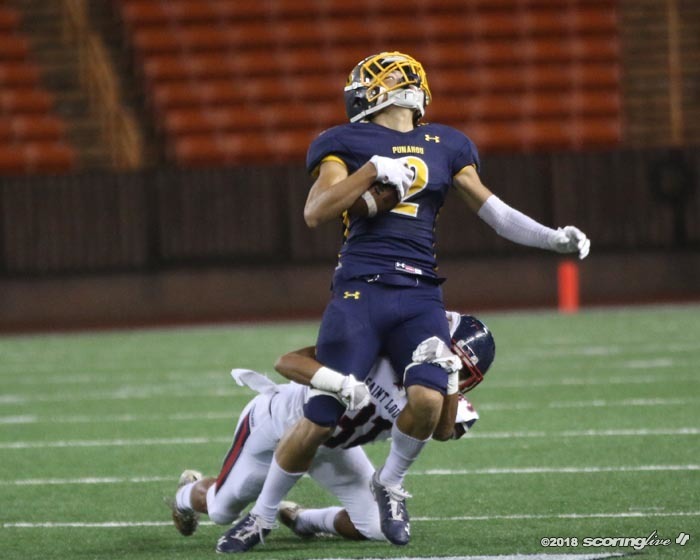 Punahou next faces fifth-ranked Campbell Saturday in Ewa Beach, while Saint Louis will visit No. 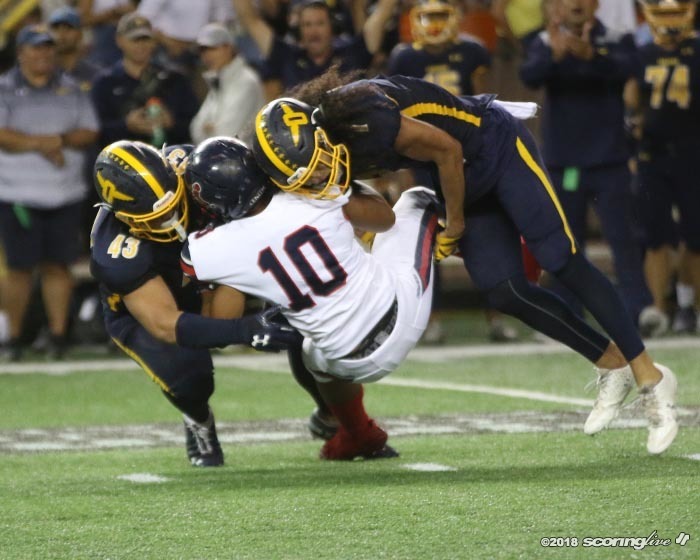 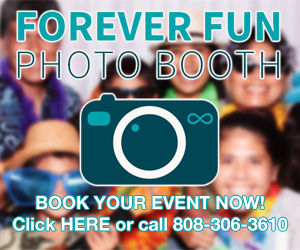 7 Kapolei Friday night.